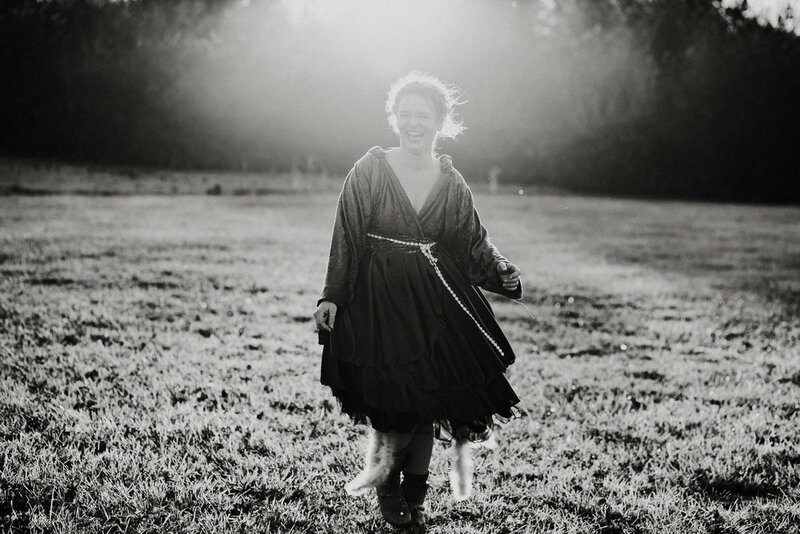 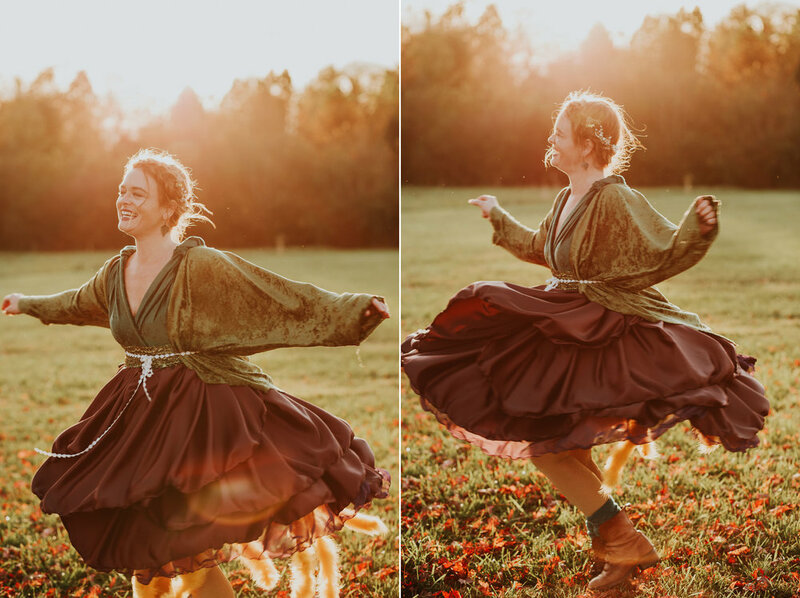 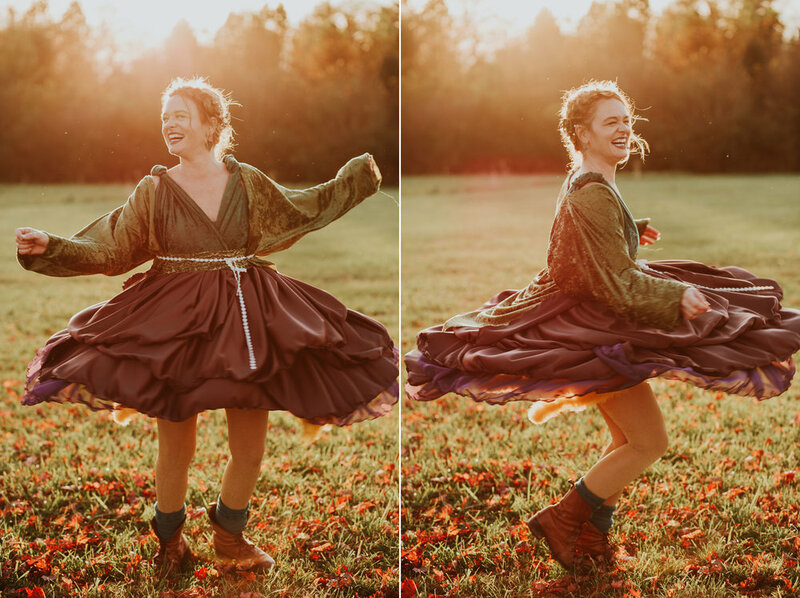 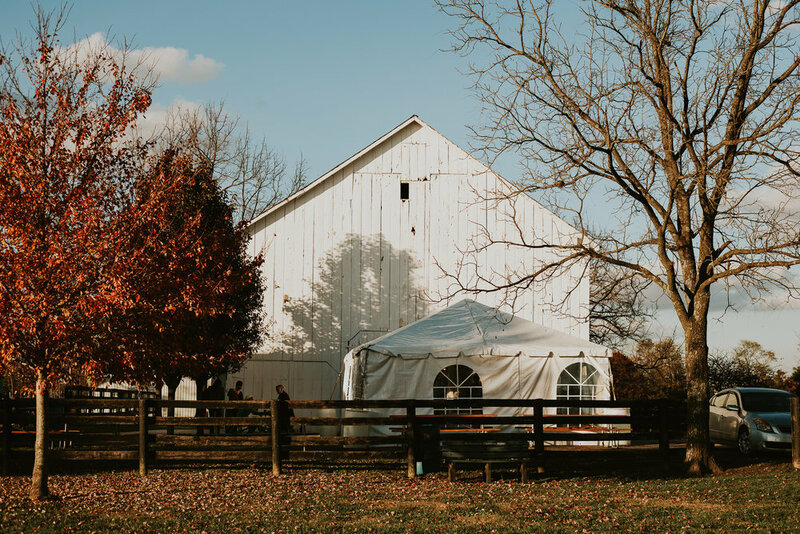 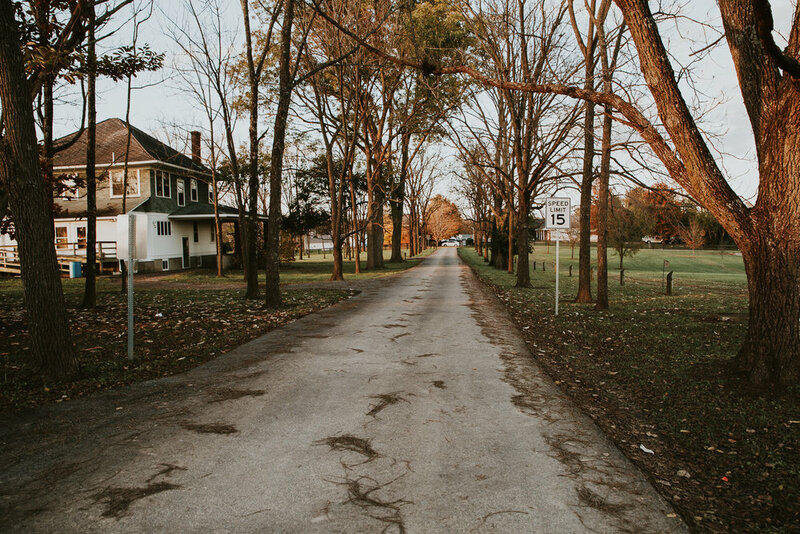 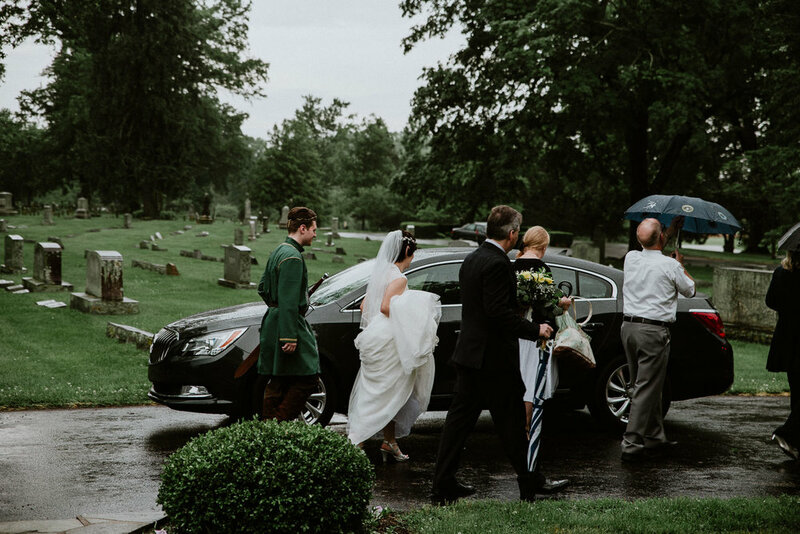 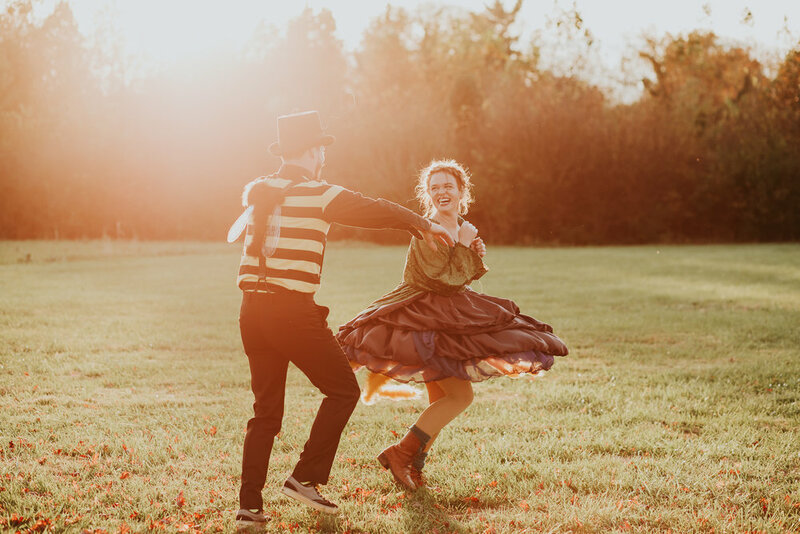 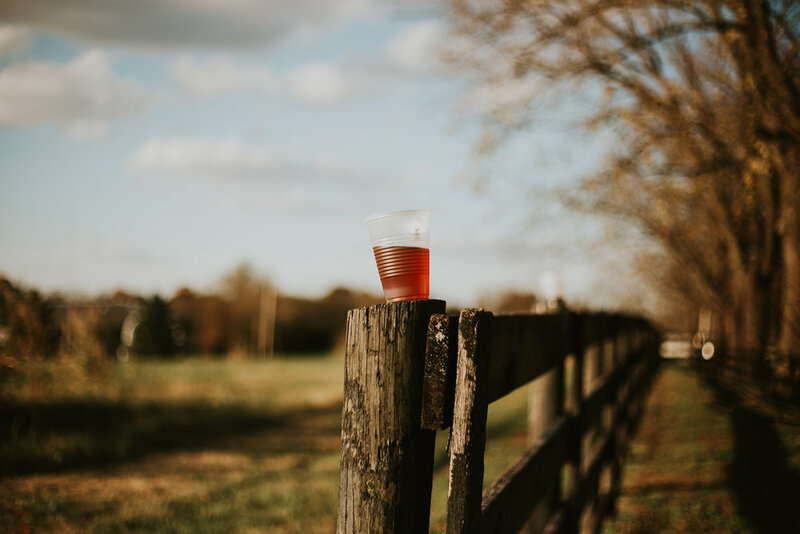 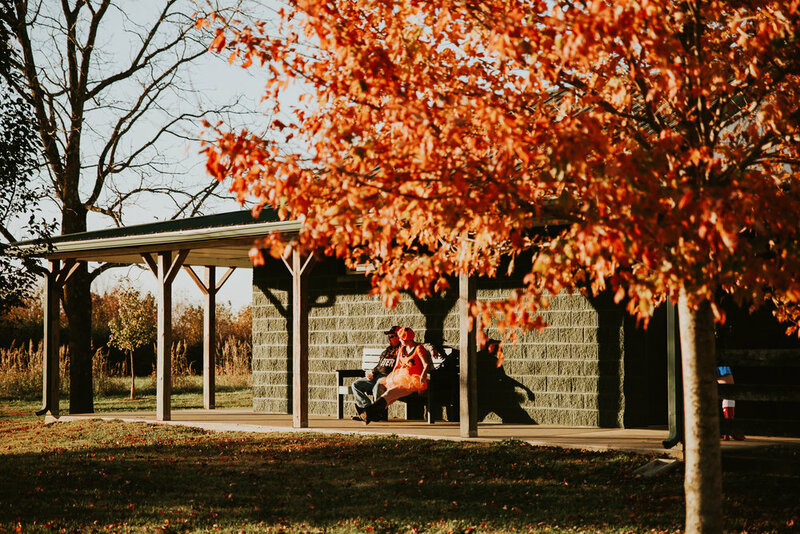 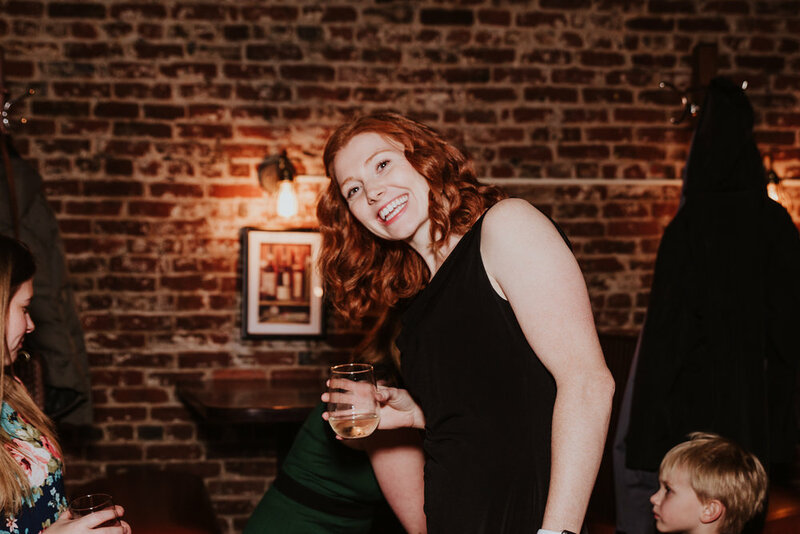 As a Louisville photographer, I am pretty centrally located to travel this way and that for weddings out of town— so when I heard from Emily (who I met while studying abroad in Ireland in college) about photographing her and Steve’s wedding in Toledo, Ohio, I was excited! 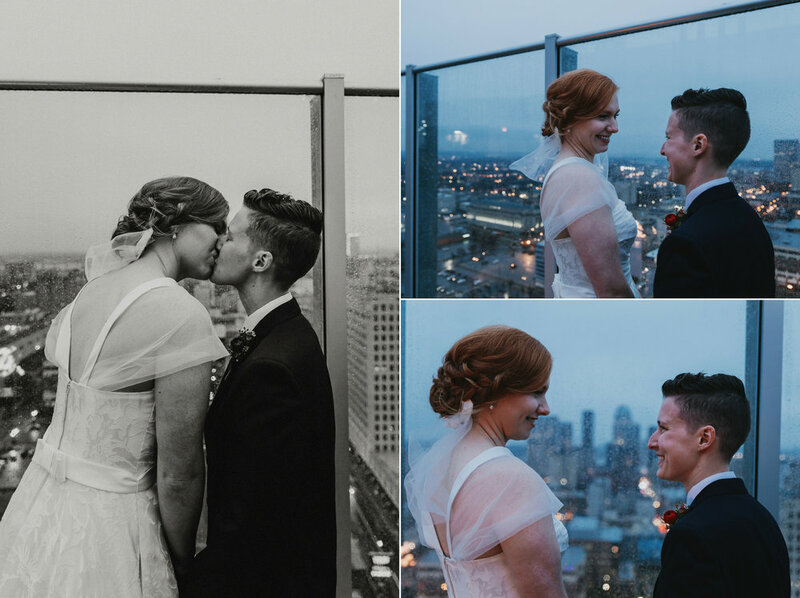 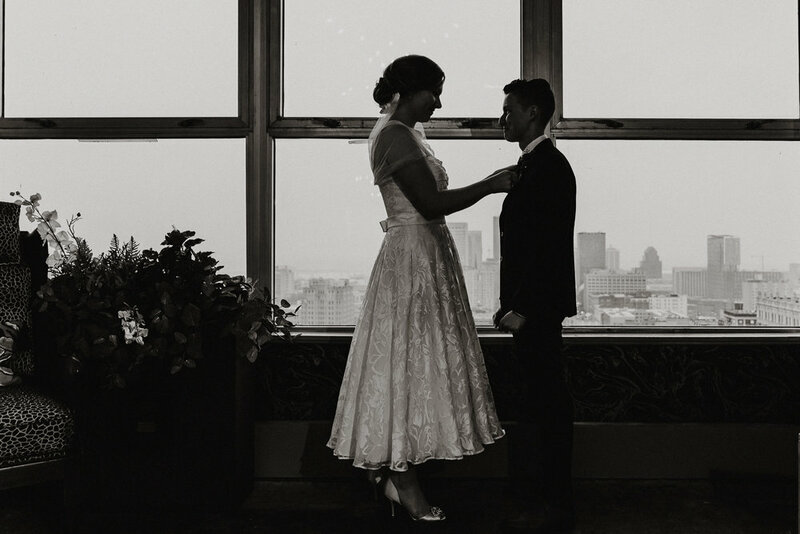 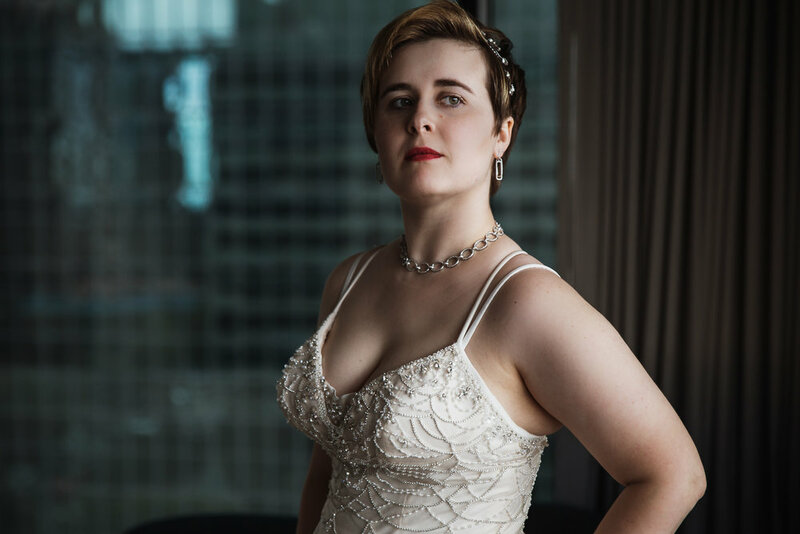 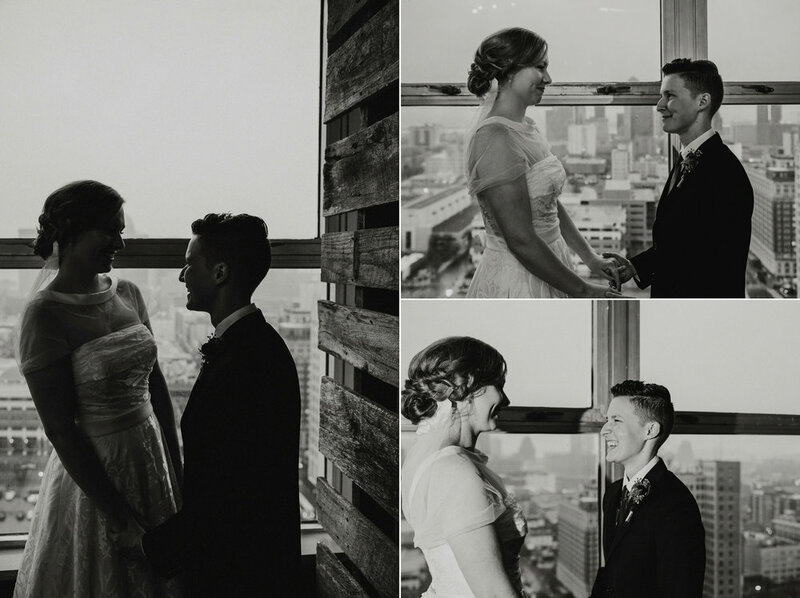 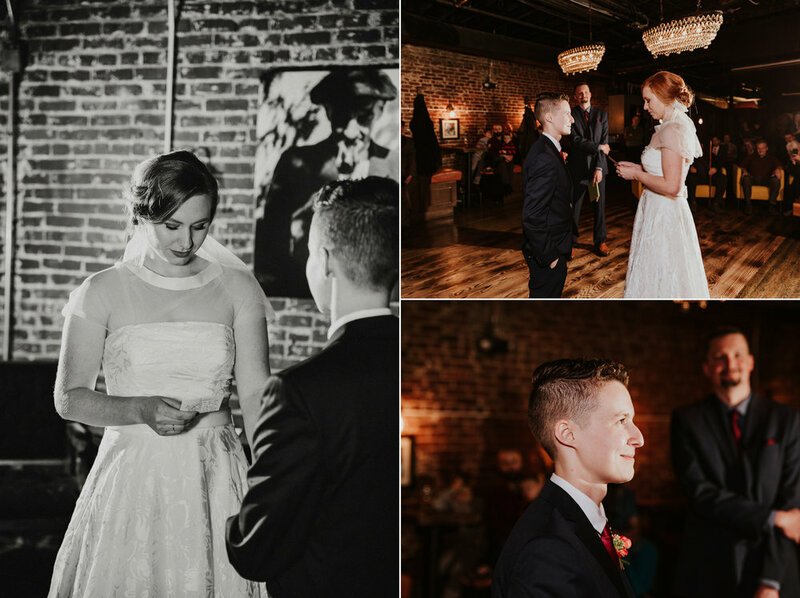 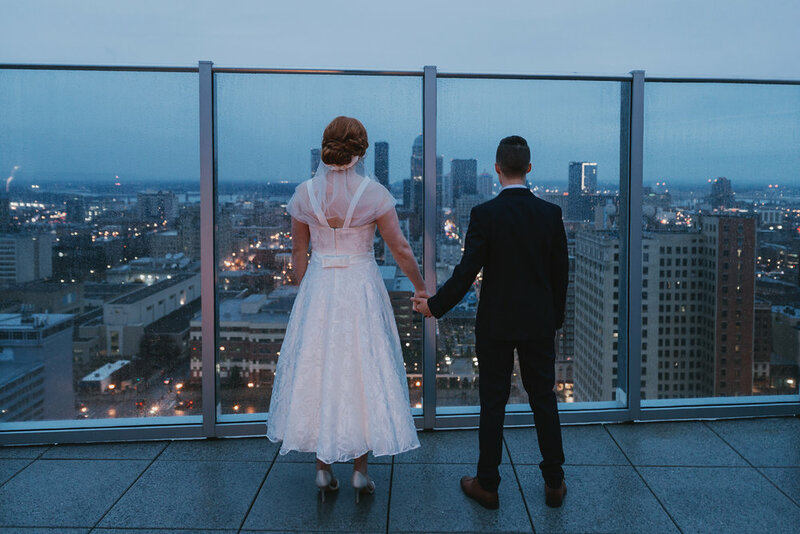 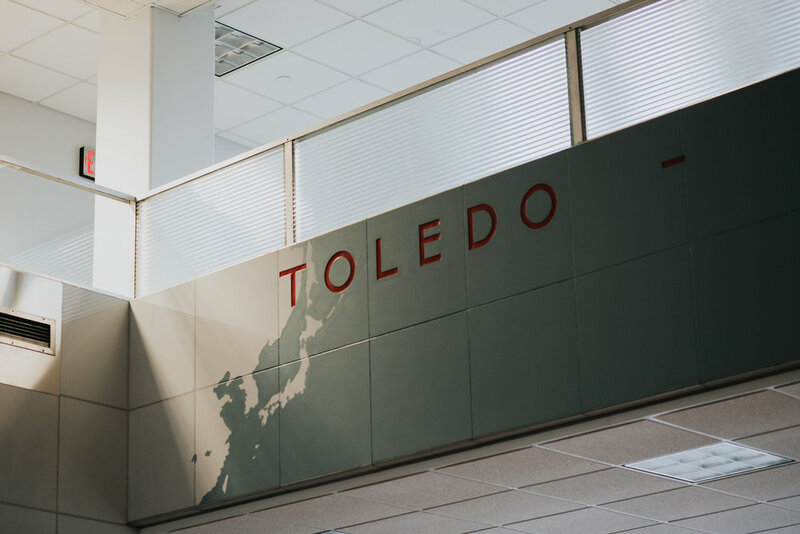 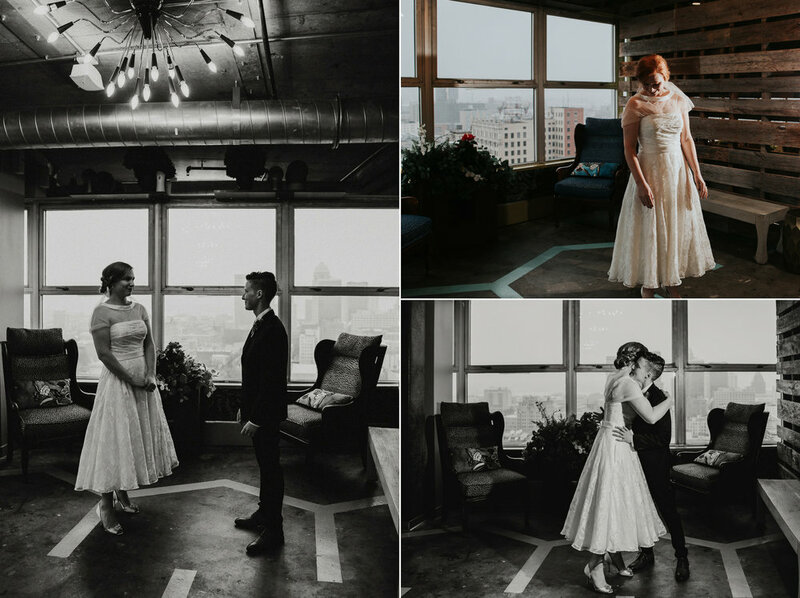 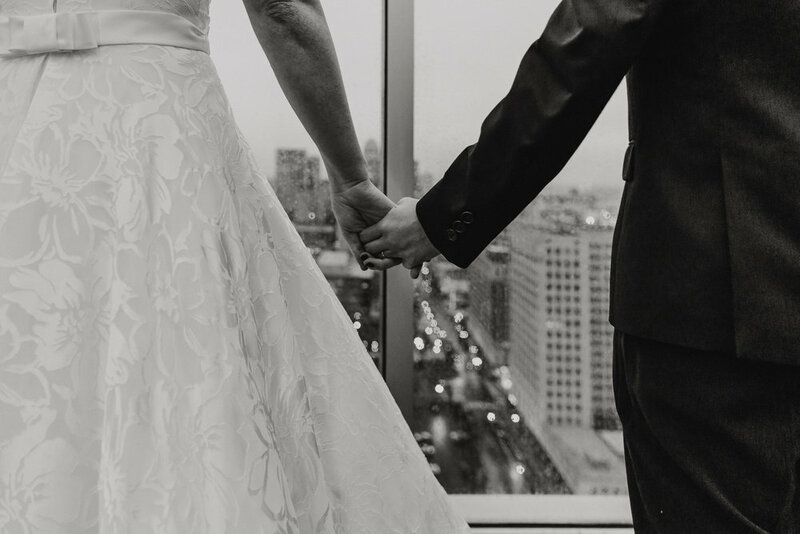 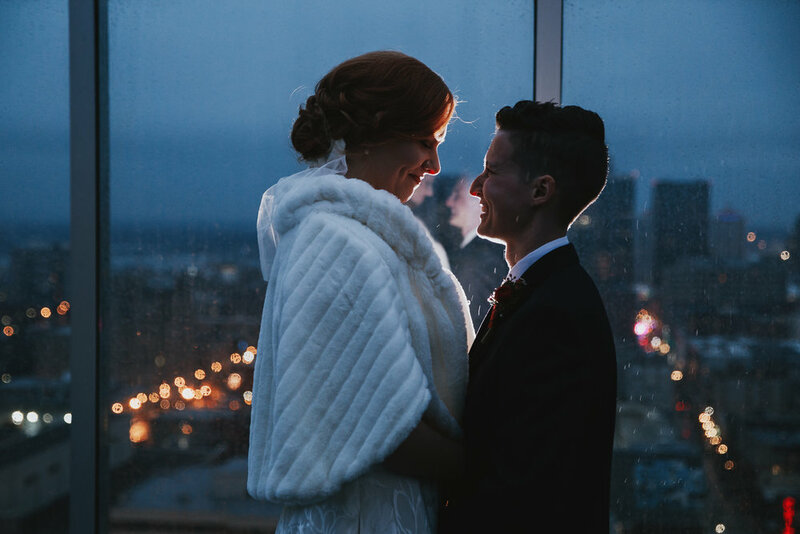 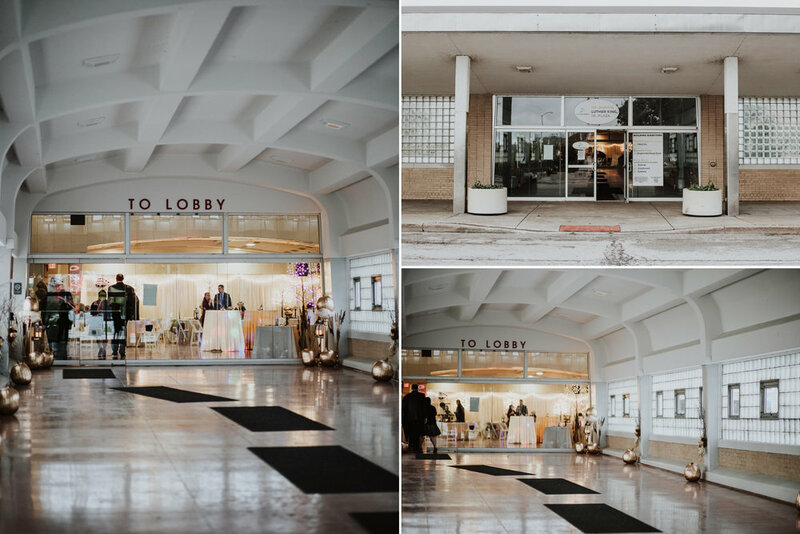 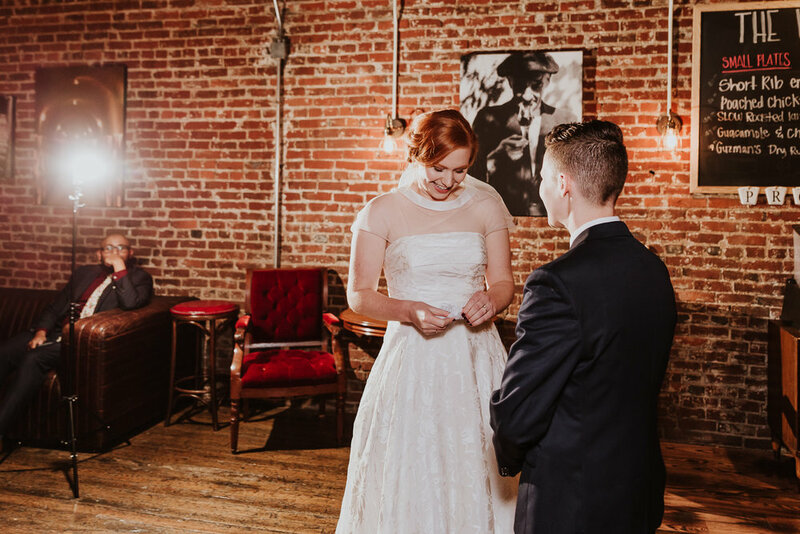 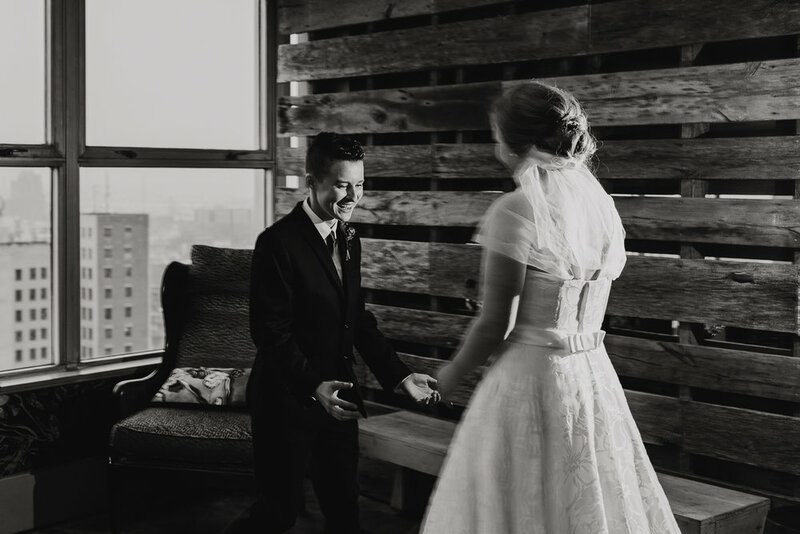 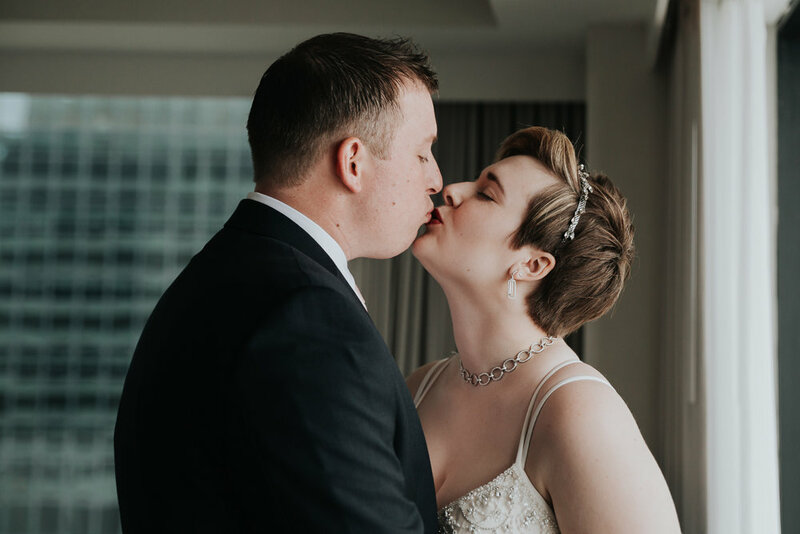 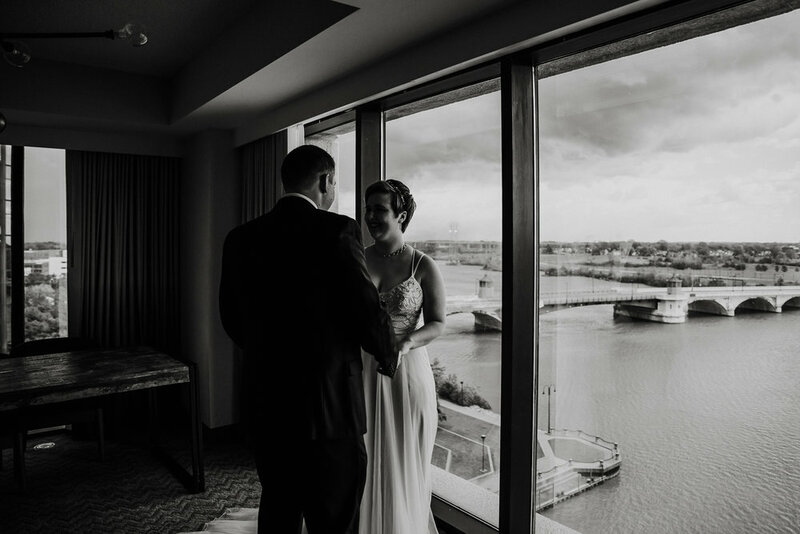 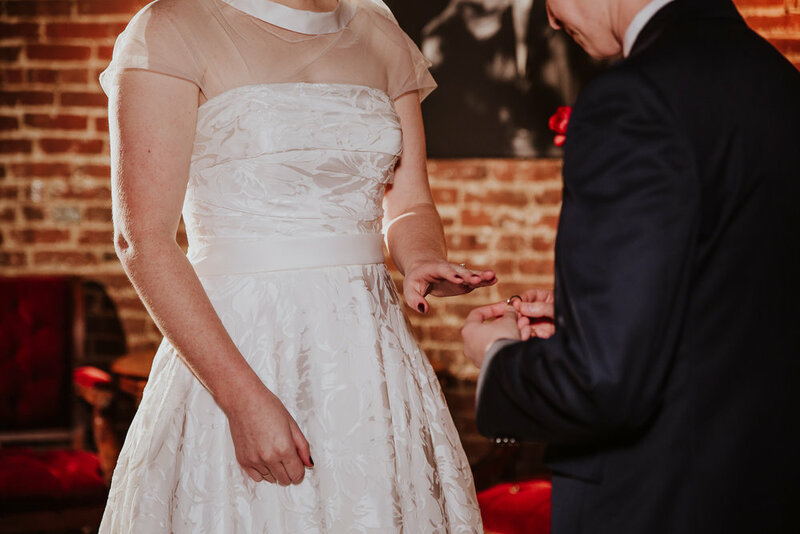 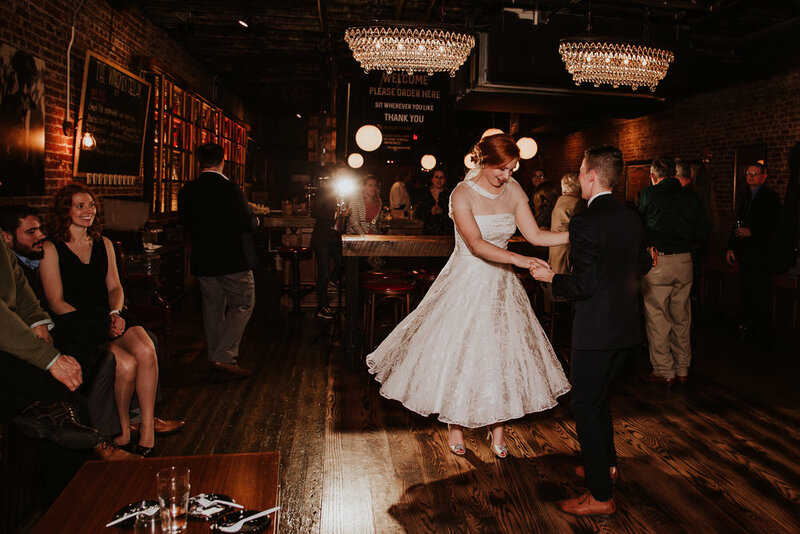 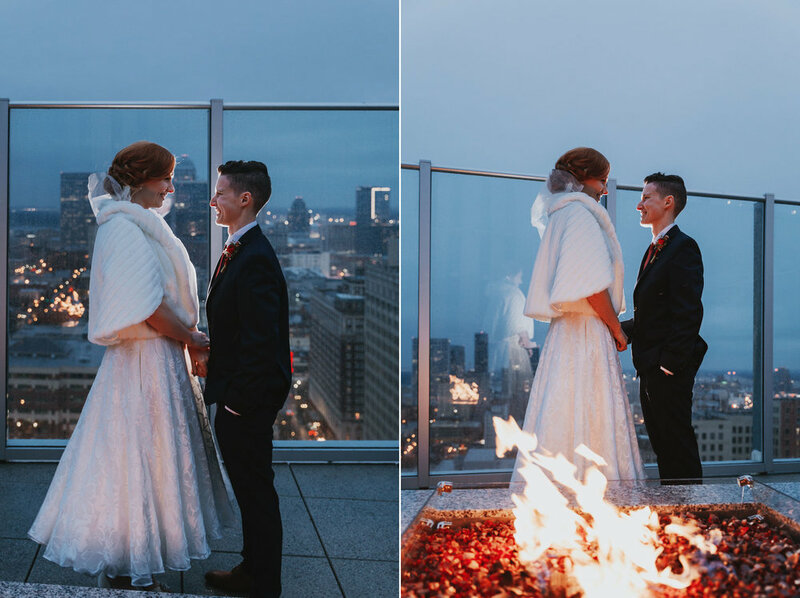 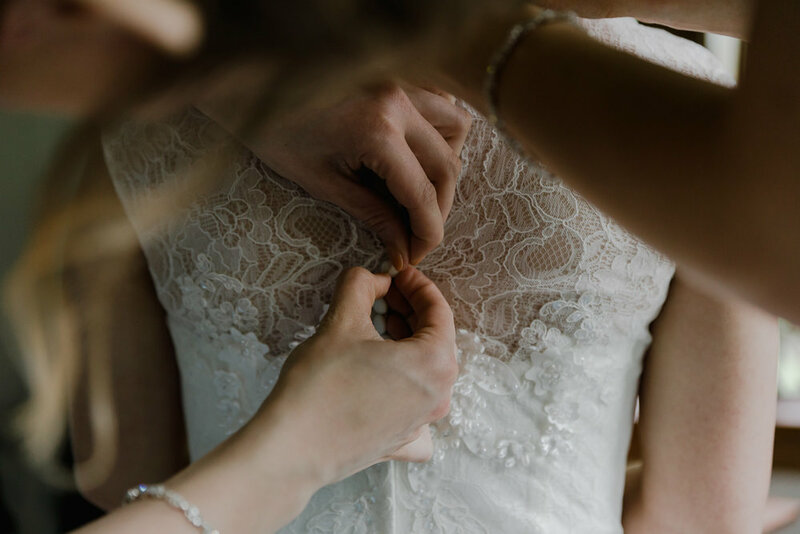 She and Steve technically got married the year before in a small ceremony, and decided to “do it up right” in October with a day of getting ready at the Renaissance Downtown Toledo followed by a reception at the Downtown Toledo Train Station. 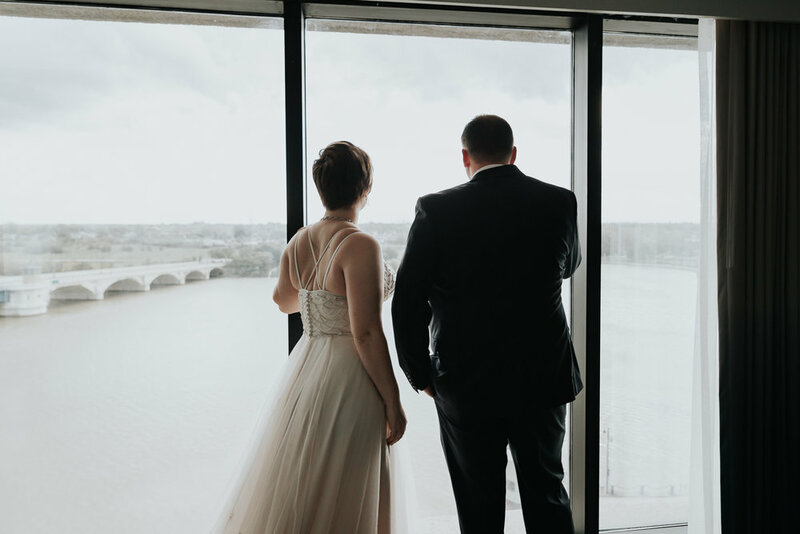 I spent the morning with Emily and her close friends in her hotel room suite (which had the most GORGEOUS view and window light) where they all donned robes, drank mimosas, and had breakfast. 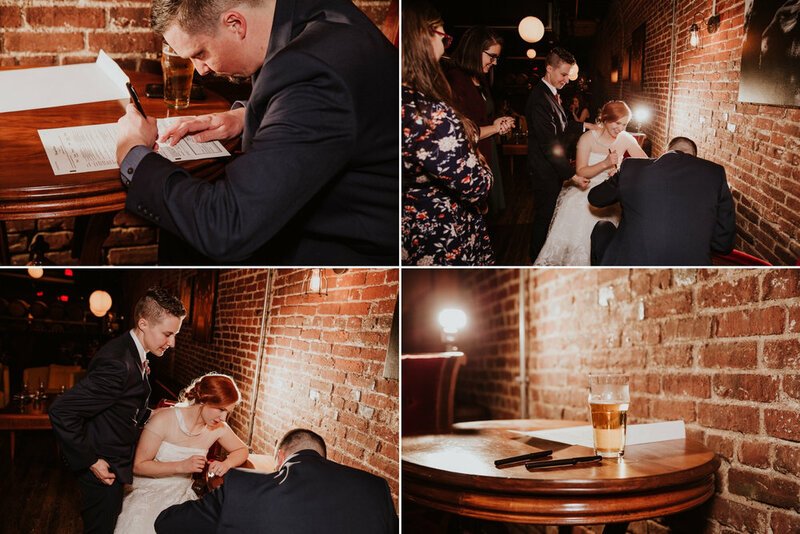 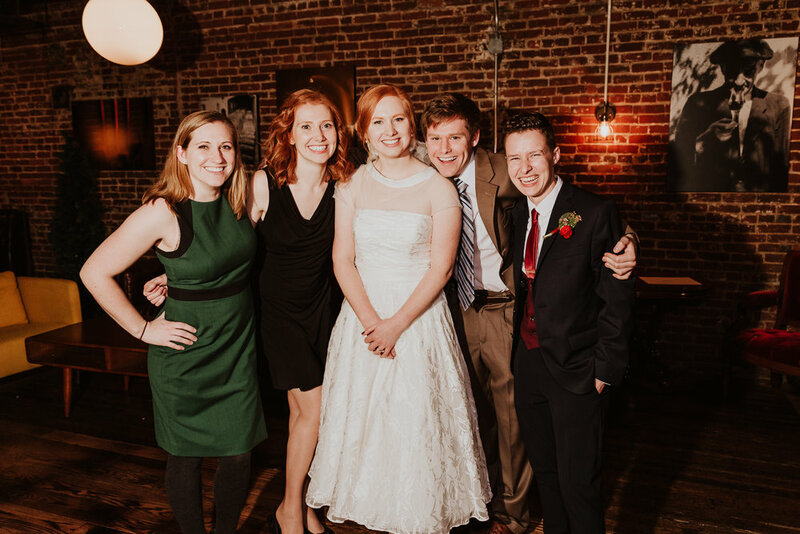 They presented Emily with a very thoughtfully created scrapbook (I’m not crying, you’re crying), and many photos were taken of the group with the bride. 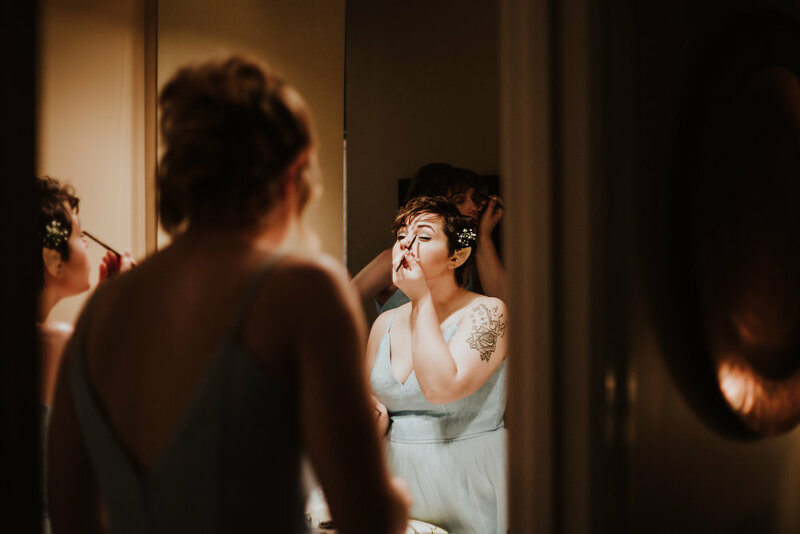 Once the group left, Emily’s mom set to work getting her hair ready while her friend did her makeup. 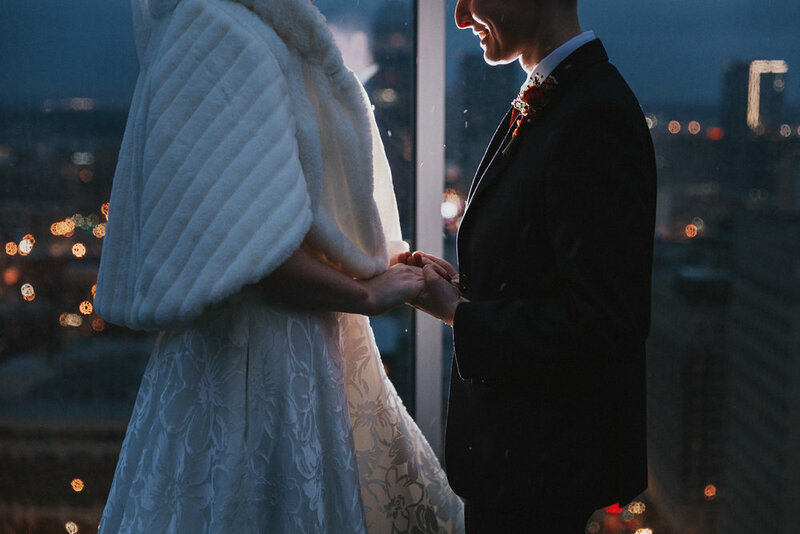 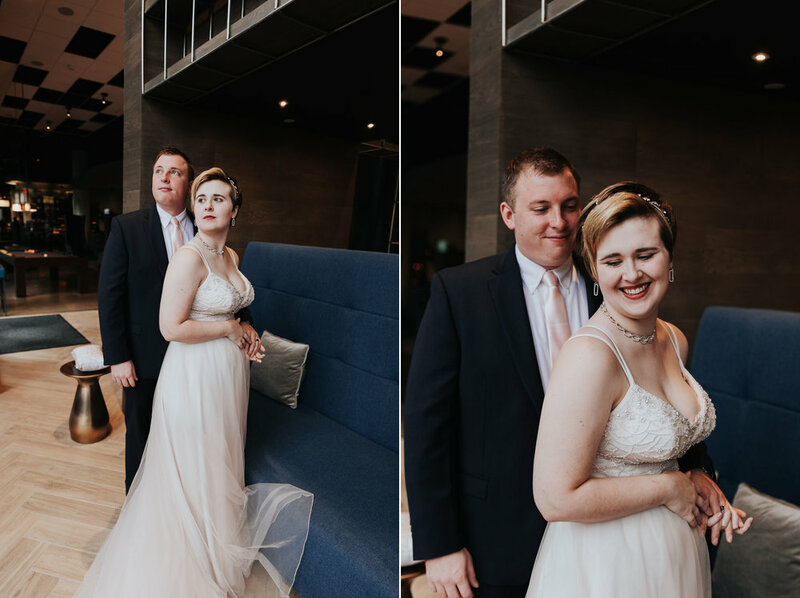 Steve was given the go-ahead to come to the room for their first look, and we took advantage of those huge windows for photos. 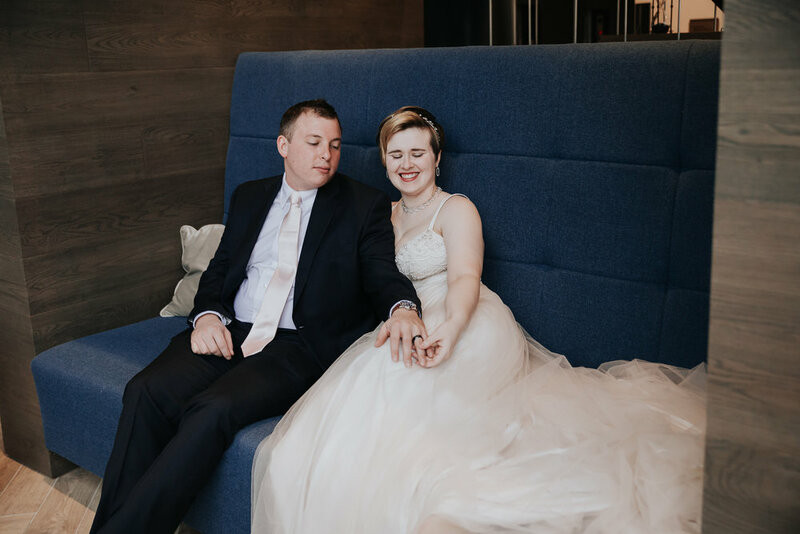 More couples photos were taken in the lobby of the hotel, then at Middlegrounds Metropark, and finally a few more at the train station. 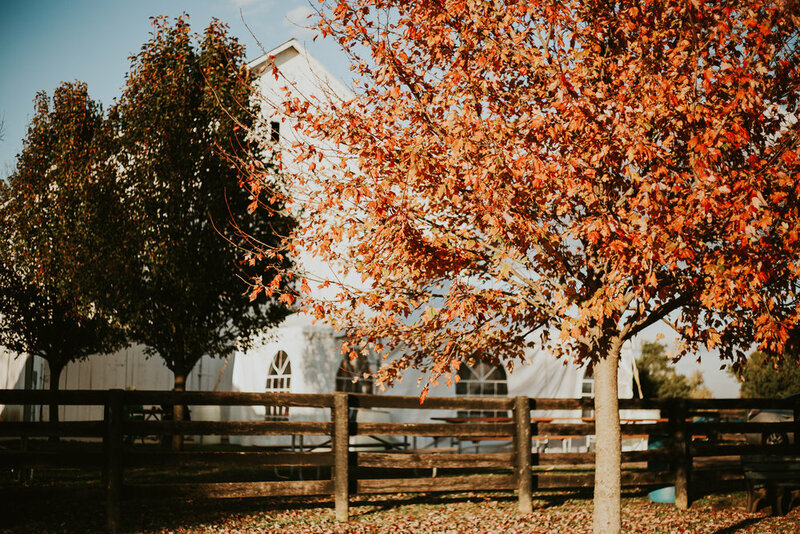 The venue was decorated with golden pumpkins, twinkle lights, and other autumn bits of flair. 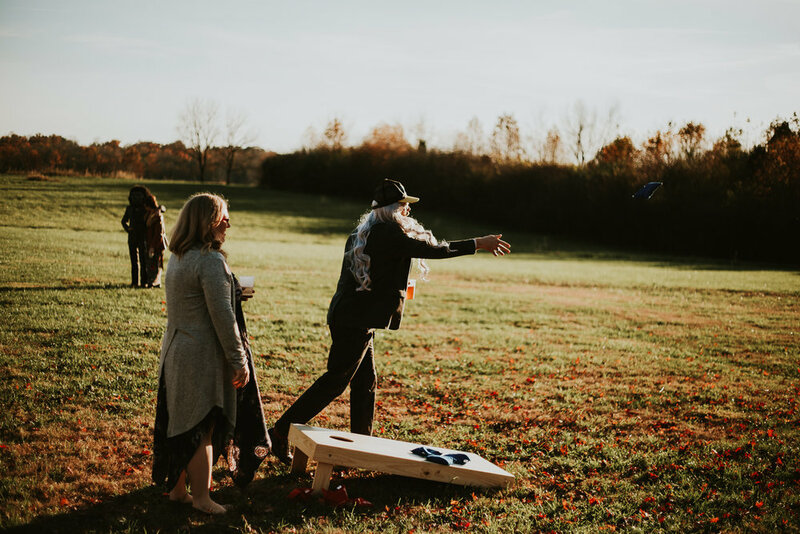 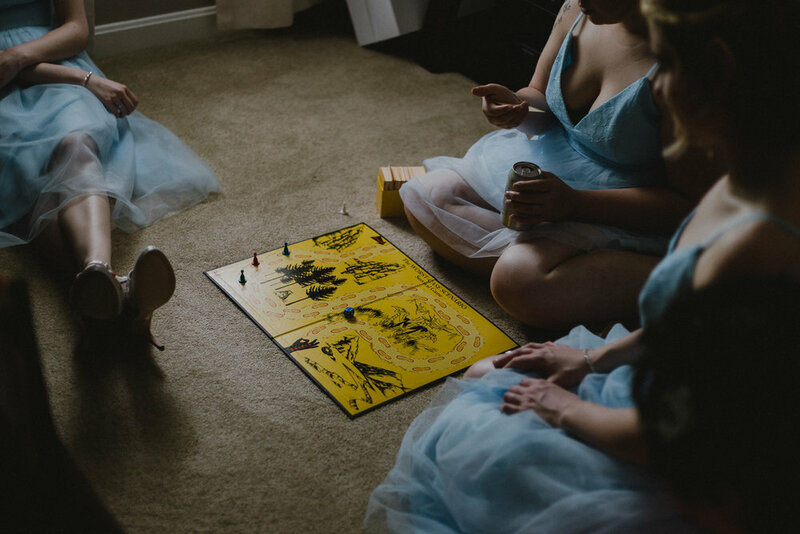 There was much dancing— but if they didn’t want to dance, guests were provided board games to play together. 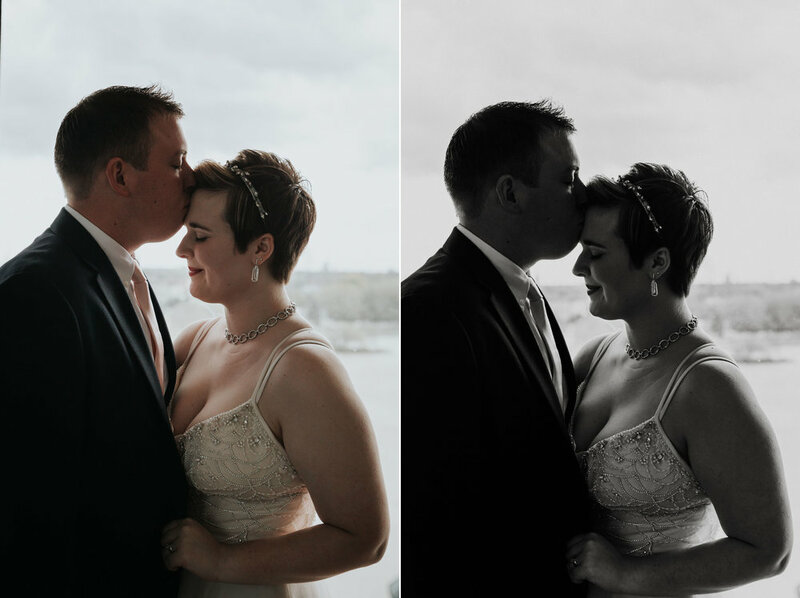 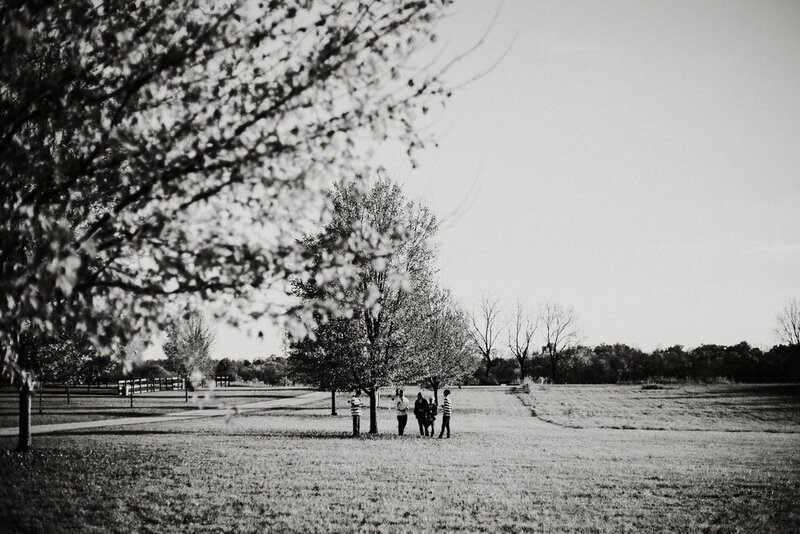 I had so much fun photographing this wedding in Toledo, I’m going to have to go back for more! 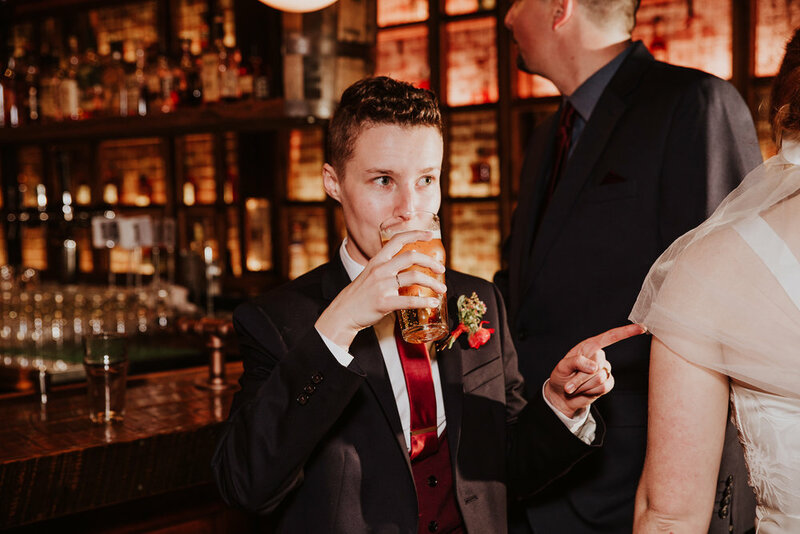 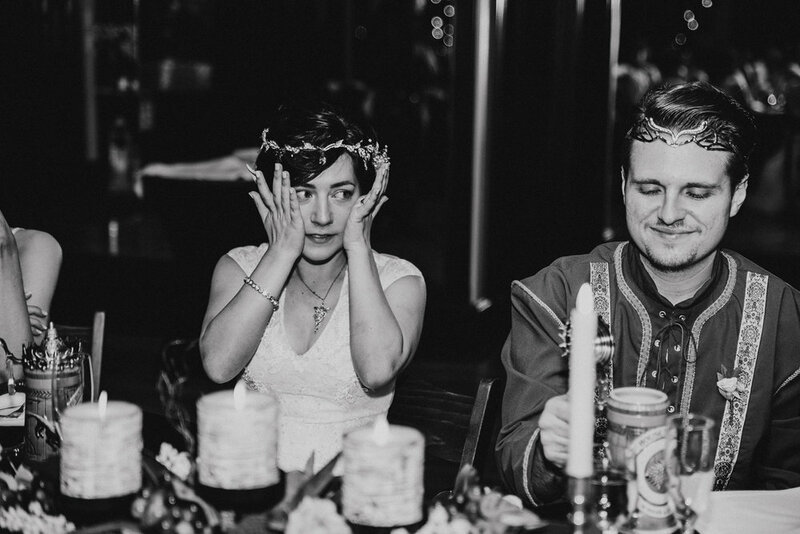 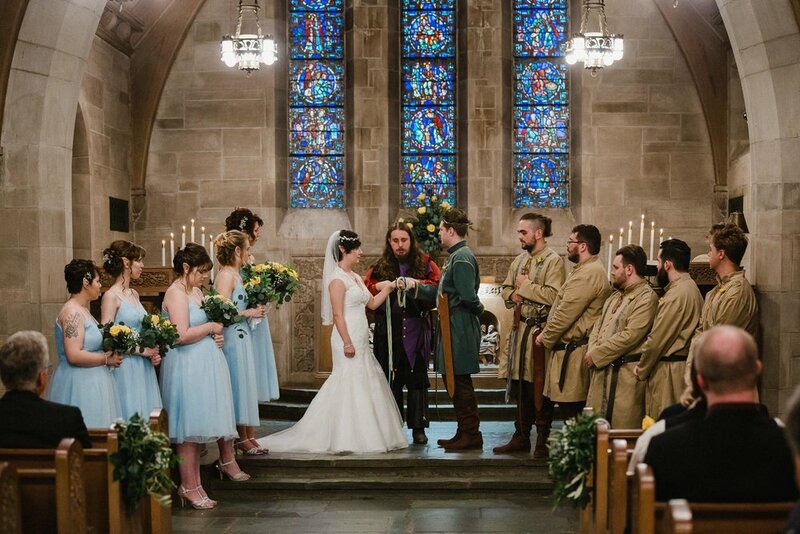 I am a huge Lord of the Rings fan, so when I found out Olivia and Donovan's spring wedding was going to be Lord of the Rings themed, I was ecstatic (there was some high-pitched squeaking involved). 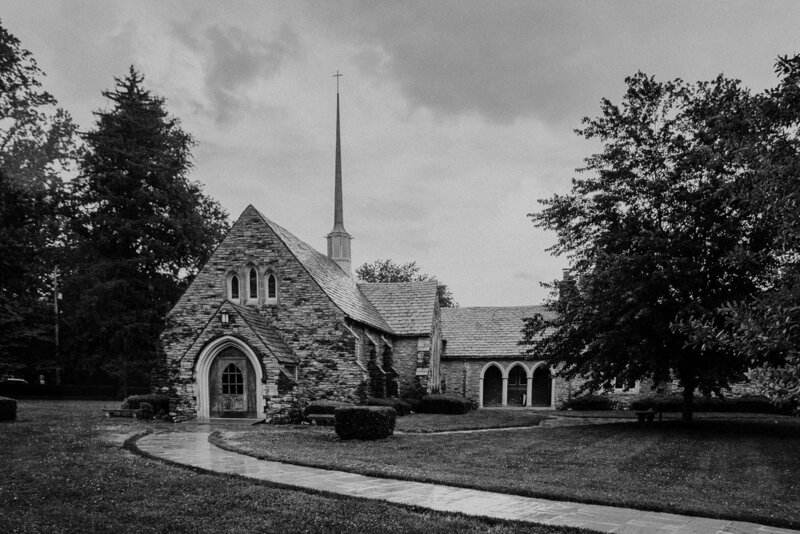 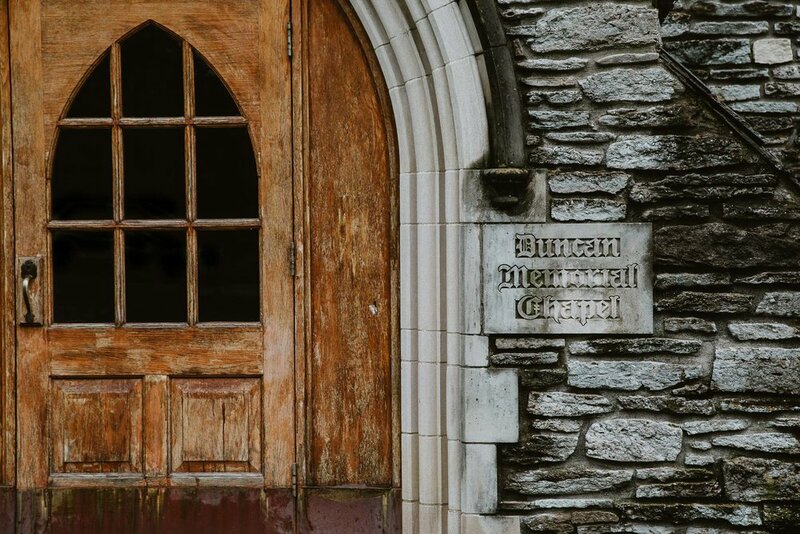 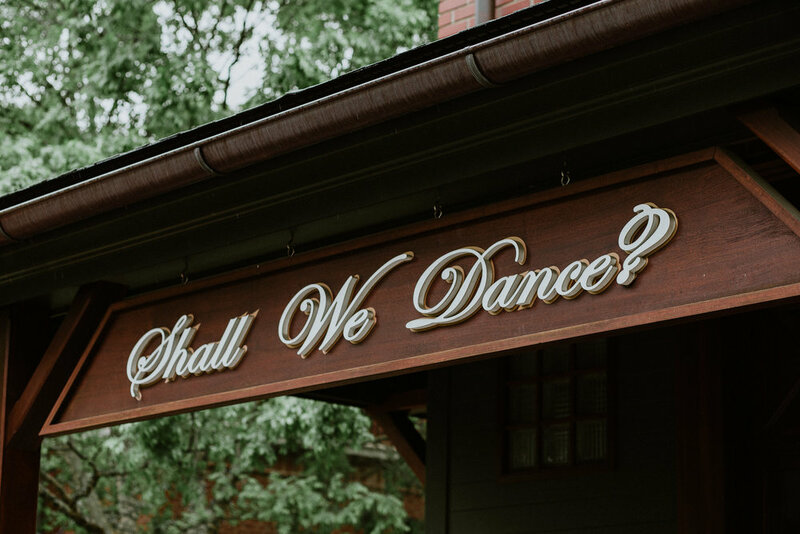 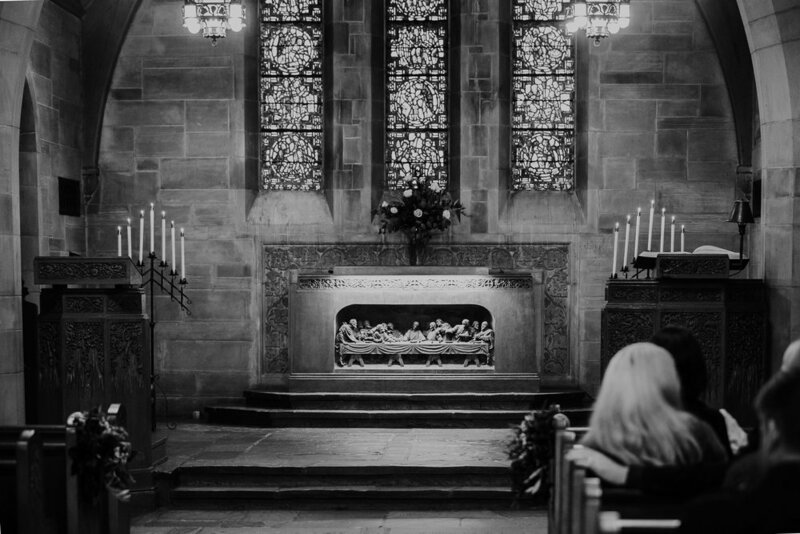 Their venues (Duncan Memorial Chapel for the ceremony and Shall We Dance? 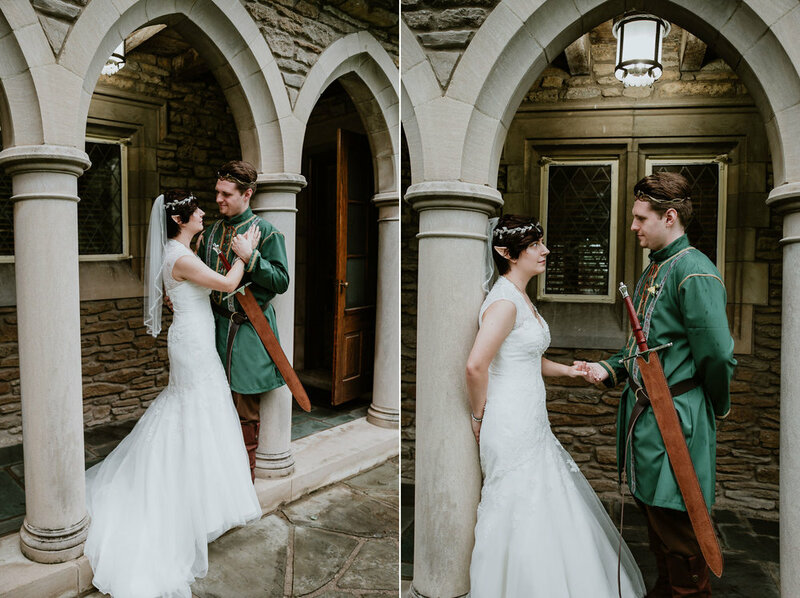 Louisville Ballroom for the reception) were carefully selected to suit the Middle Earth aesthetic, and every detail was thought of in a poetic way to make their wedding day absolutely stunning. 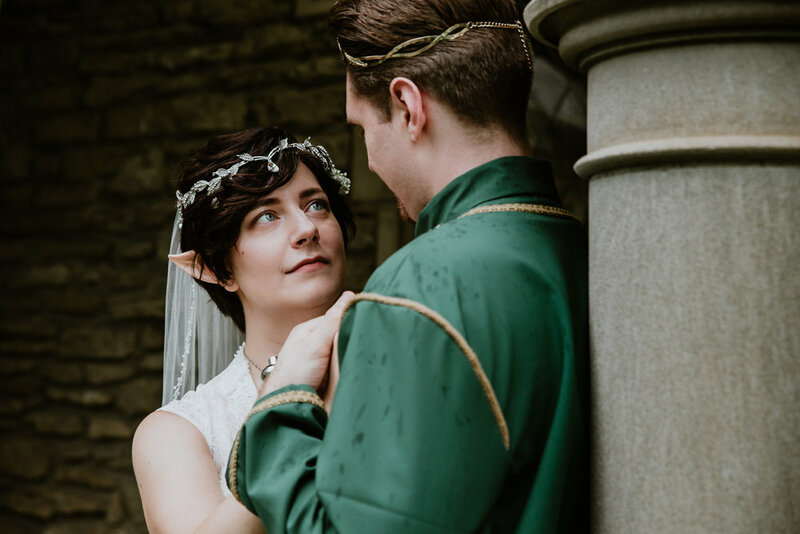 Even the rain didn't dampen the spirits of all in attendance-- it actually added to the Rivendell vibe they were going for. 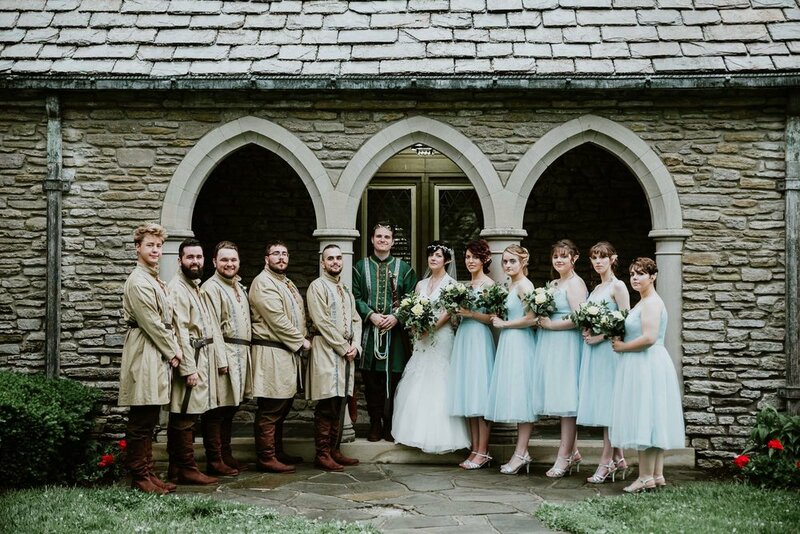 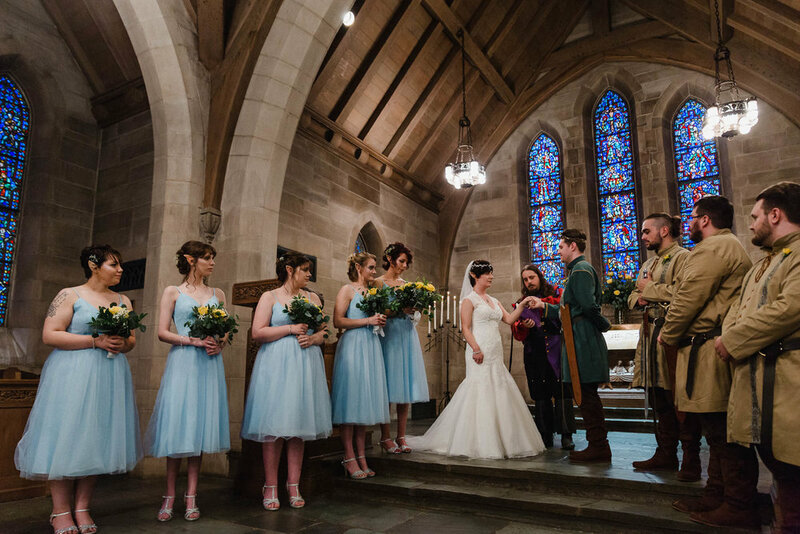 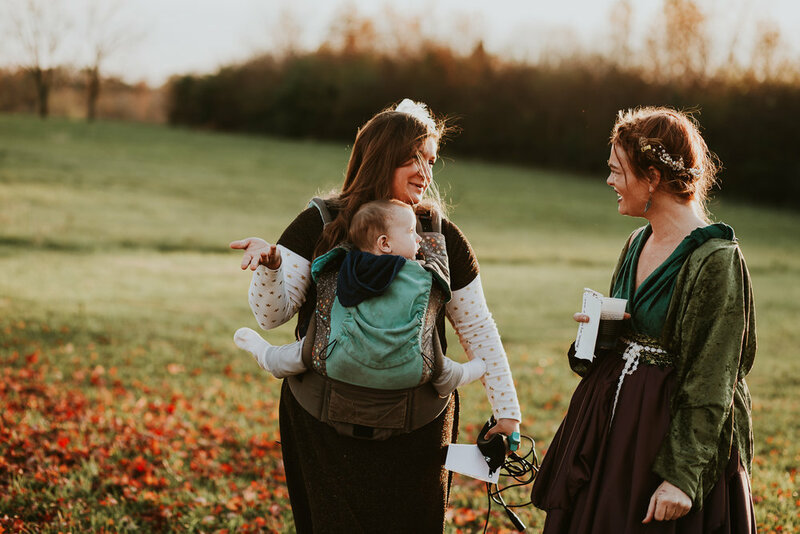 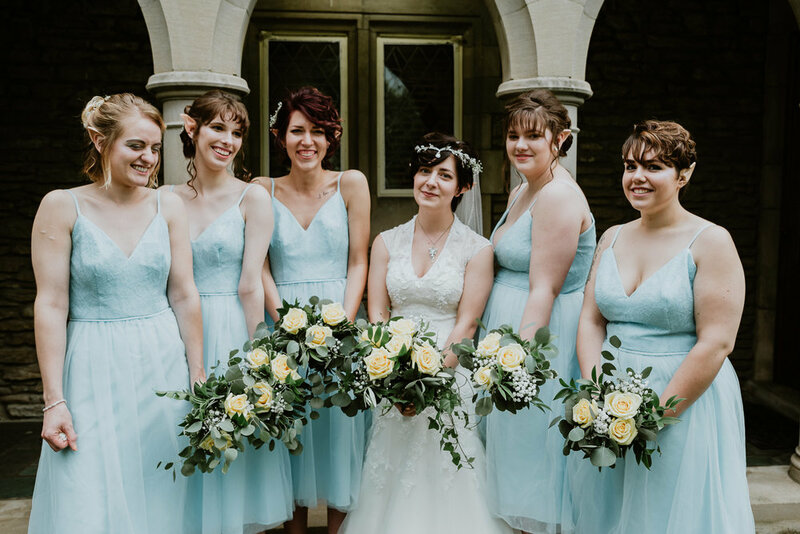 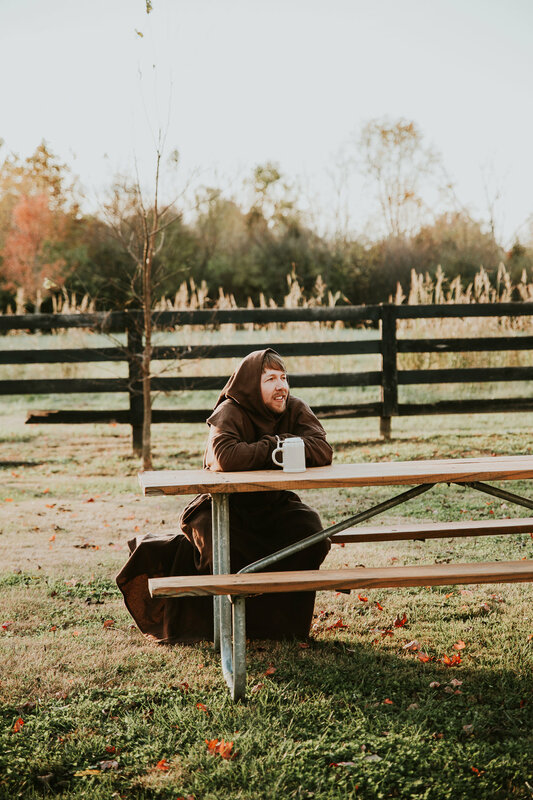 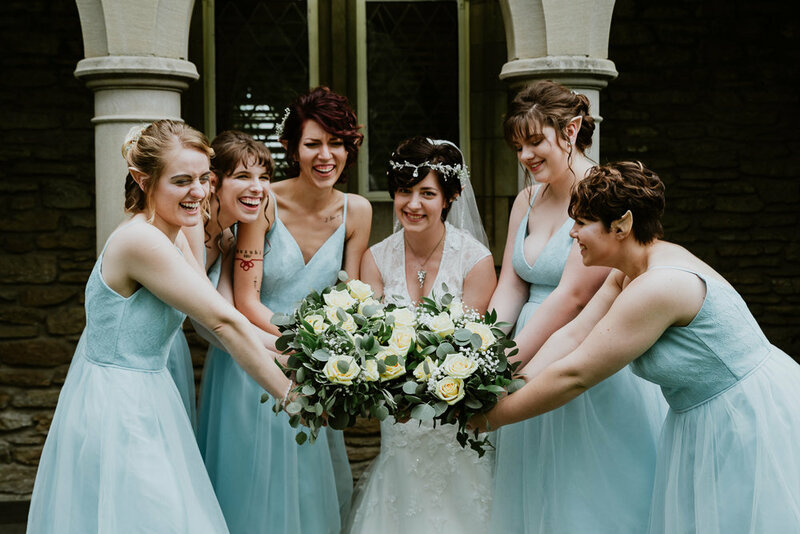 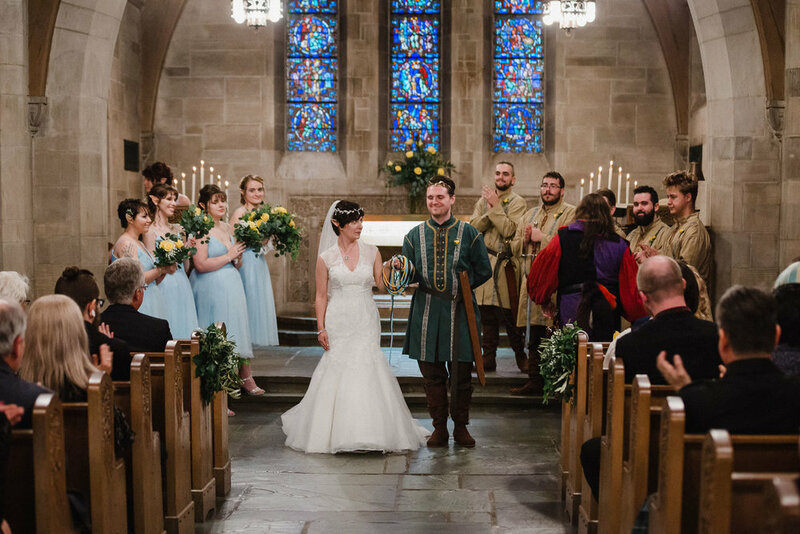 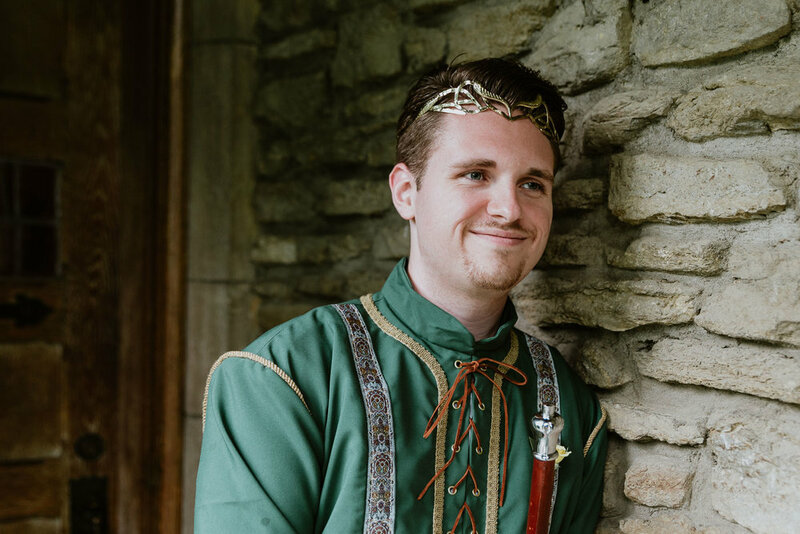 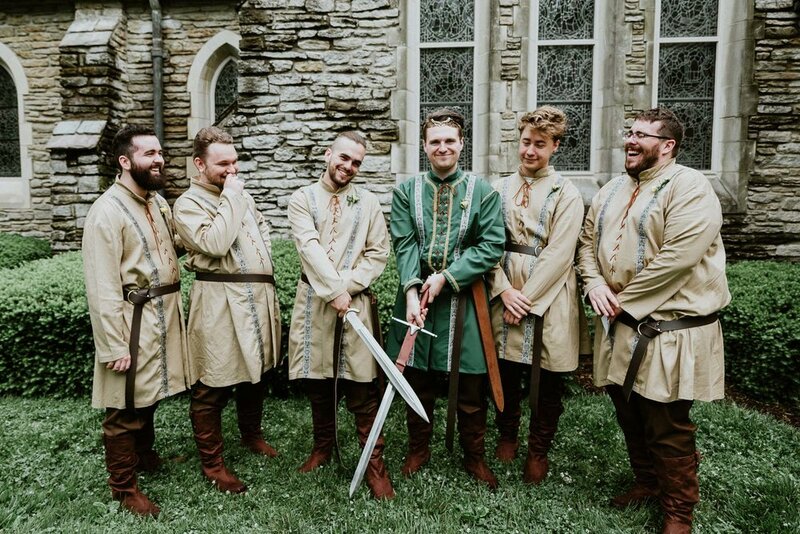 The bride and bridesmaids wore elf ears (a la Arwen and her elven kind), the groom and groomsmen wore tunics (Aragorn and his fellows)-- and the couple both donned circlets befitting their royal LotR counterparts. 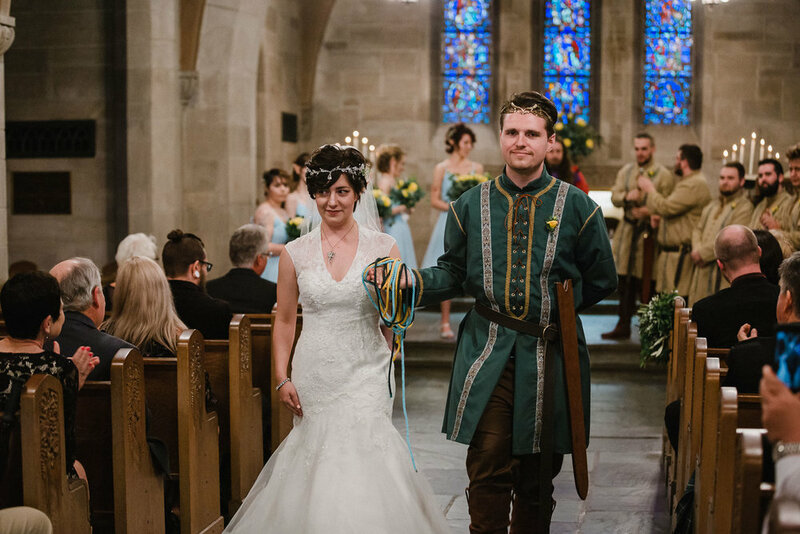 Olivia's Evenstar necklace was a lovely nod to Arwen, and Donovan and his best man each had swords at their belts, which made an appearance during their wedding ceremony. 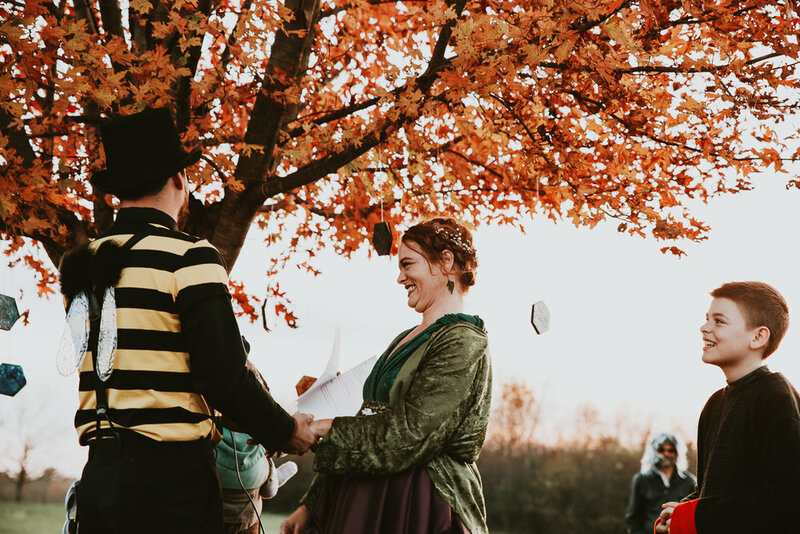 The ceremony itself was a handfasting ceremony complete with "jump the broom" ending, and was officiated by John Cowgell in his Pocket the Fool garb. 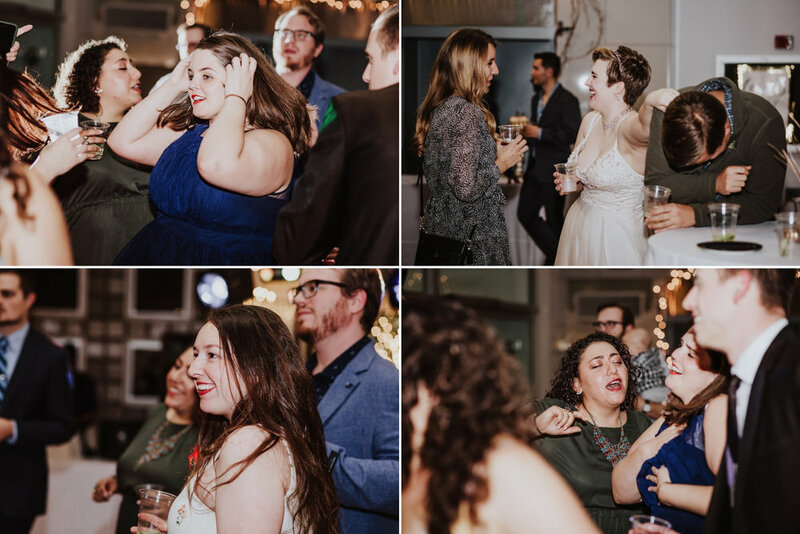 Throughout the day, the camaraderie and friendships amongst the wedding party was evident and kept all entertained. 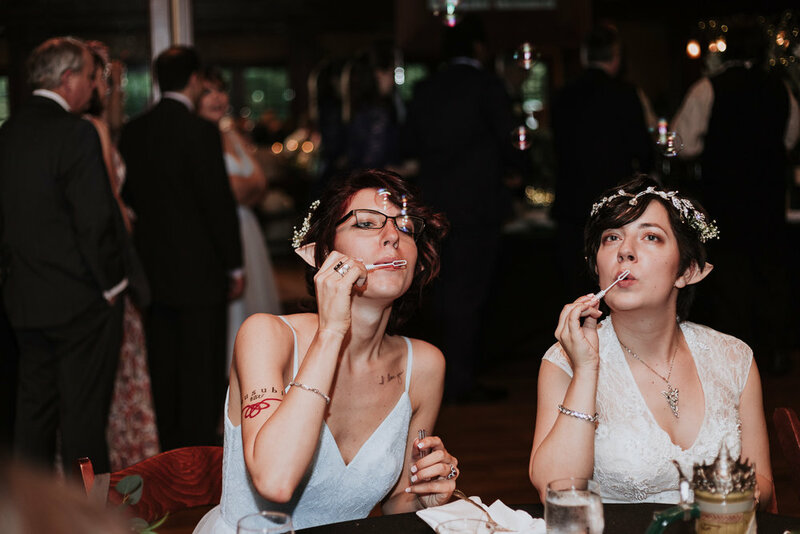 Bridesmaids chowing down on fast food, playing board games while they waited, jokes and laughter, memes and dabbing, feigned concern at the drawing of swords, dancing and drinking at the reception... 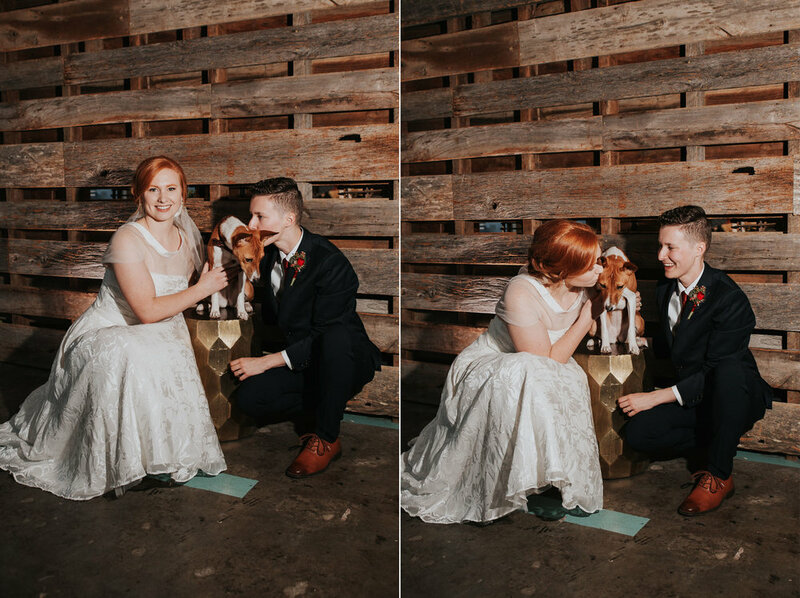 I can't describe it all, but I hope the photos below do their day justice. 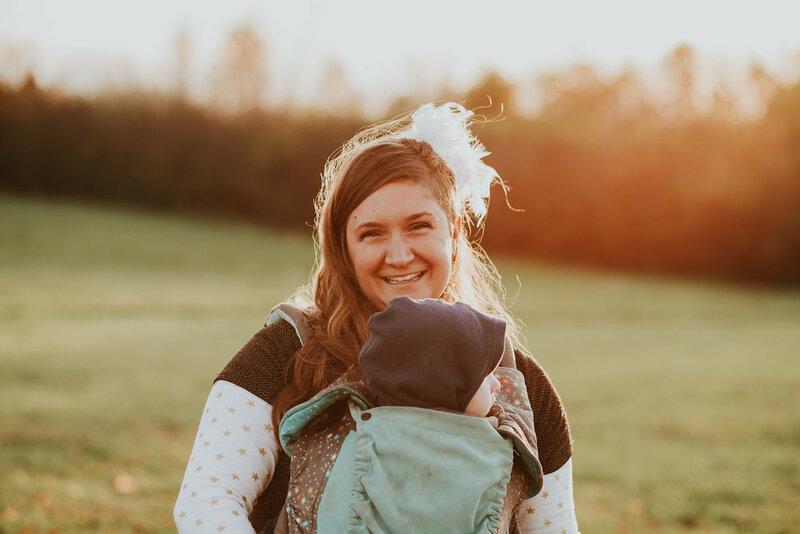 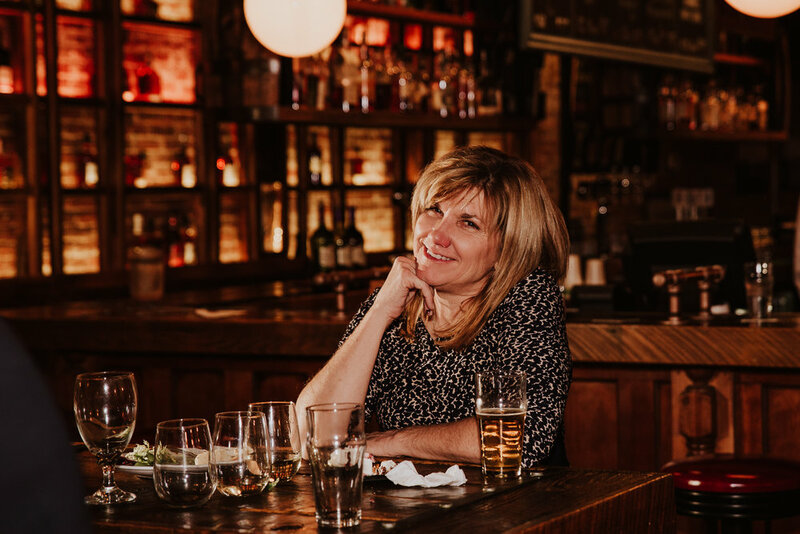 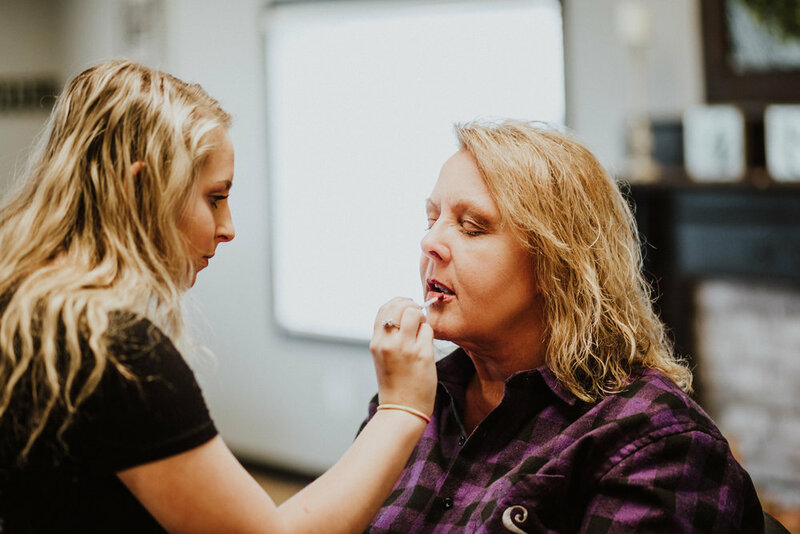 When I first met with Sheri to discuss her wedding, I was struck by her friendly personality and obvious love for her family. 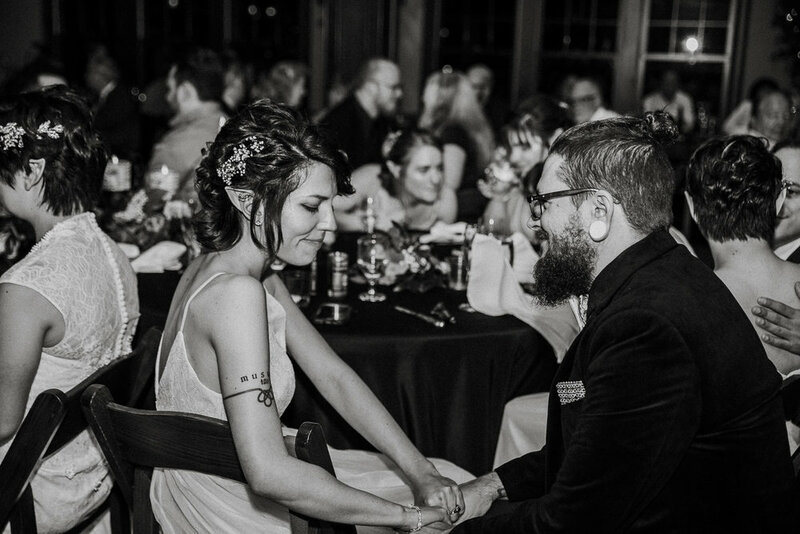 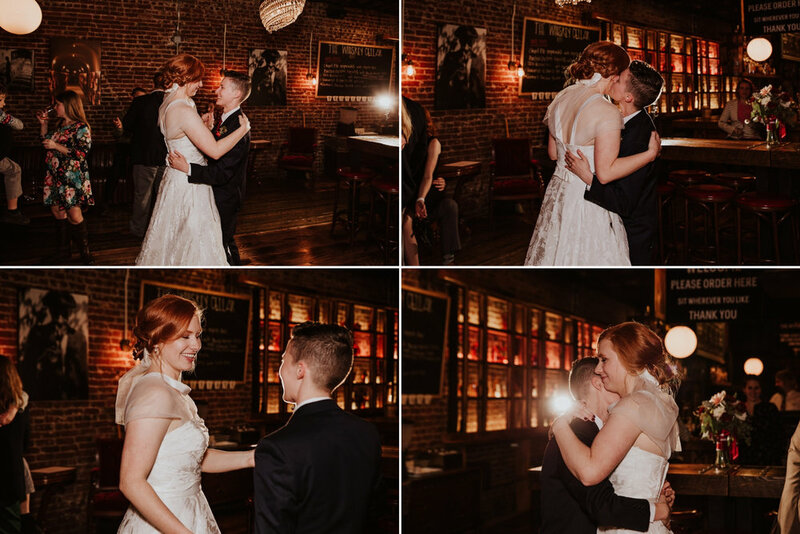 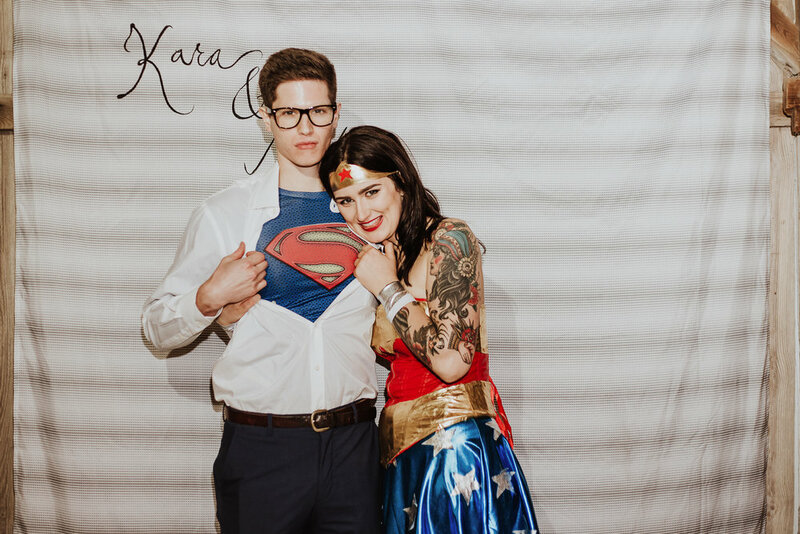 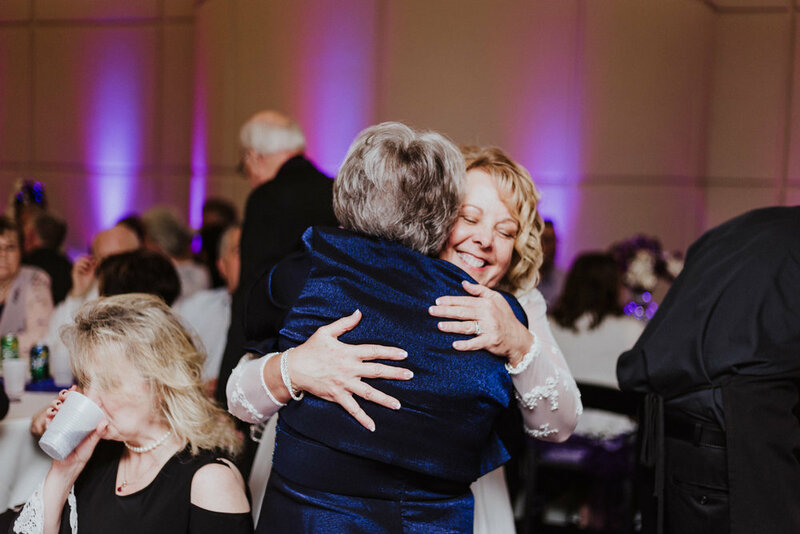 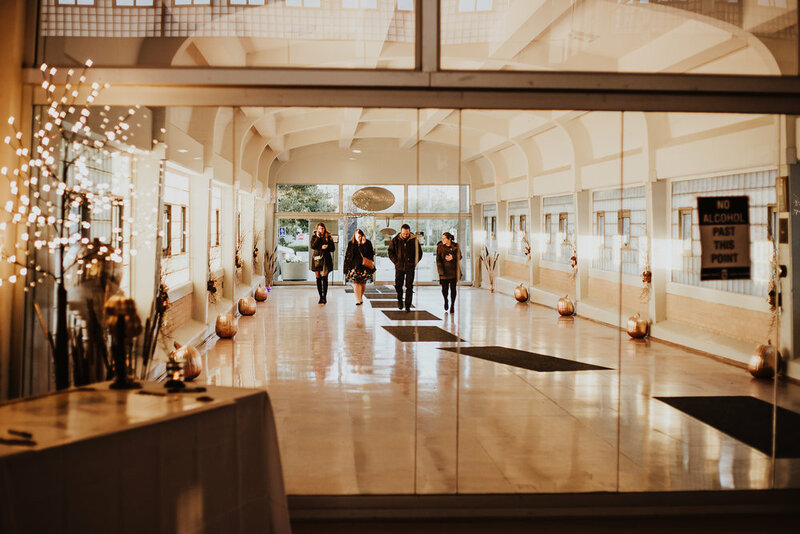 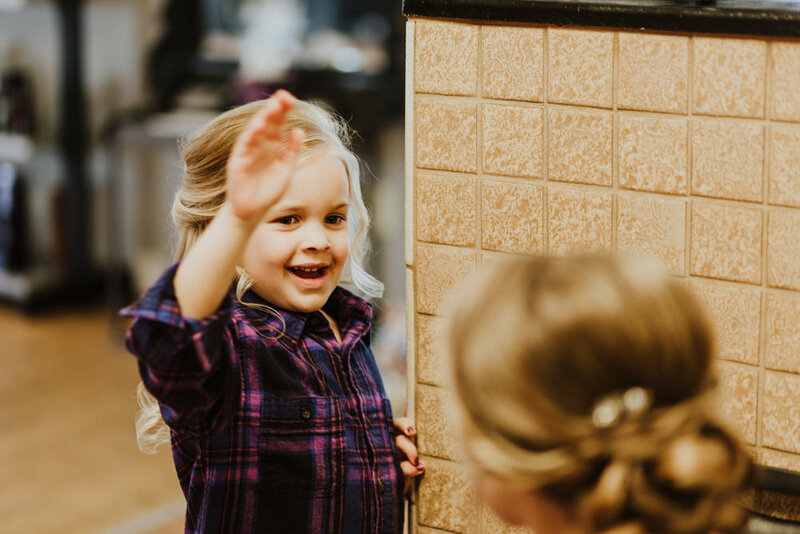 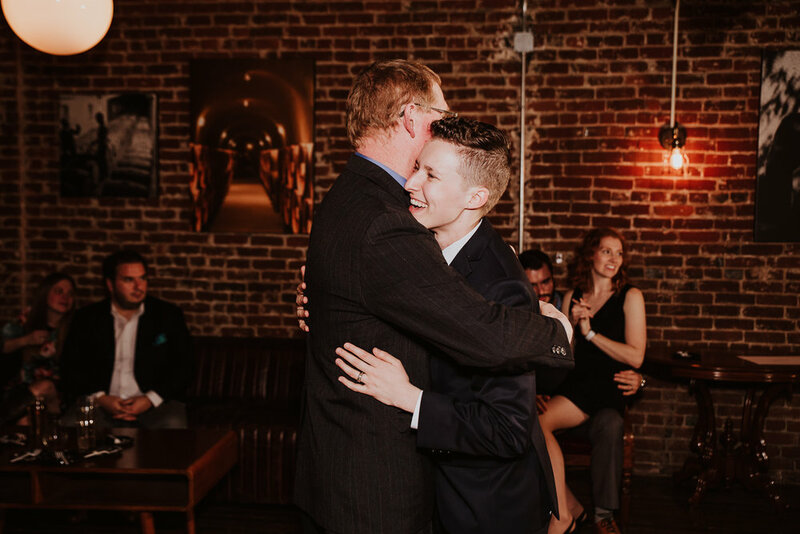 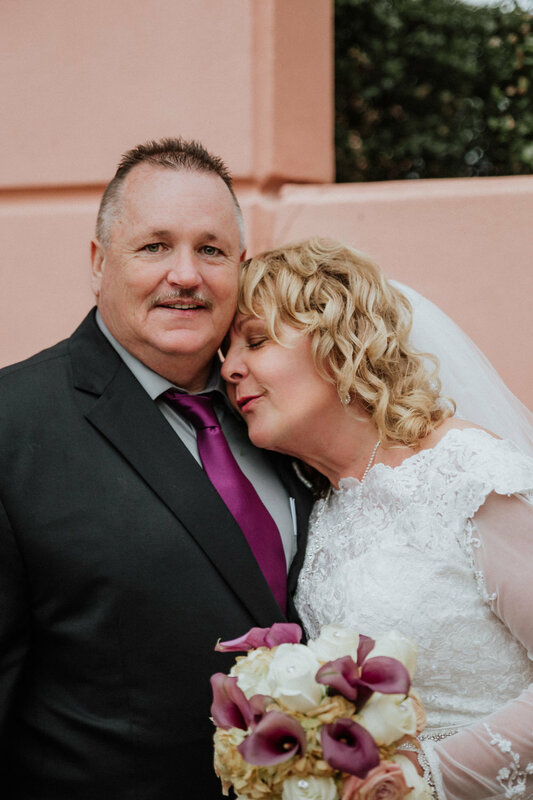 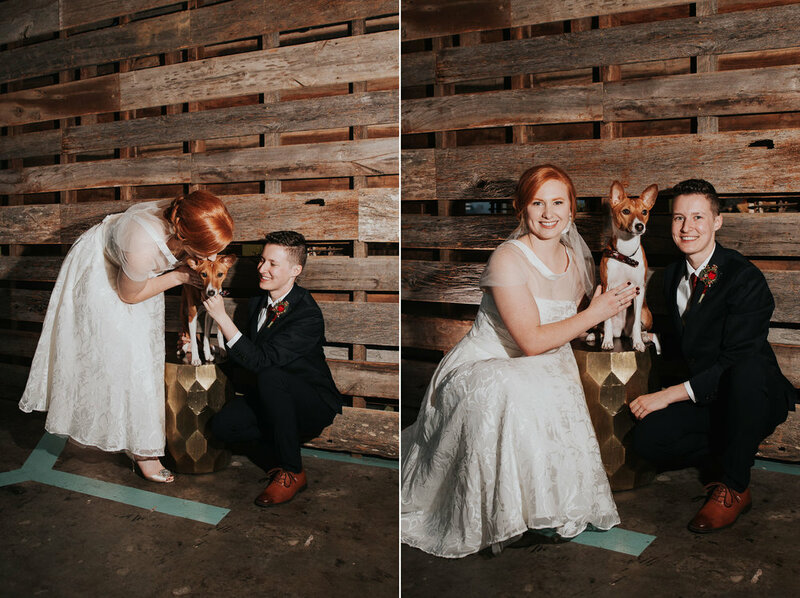 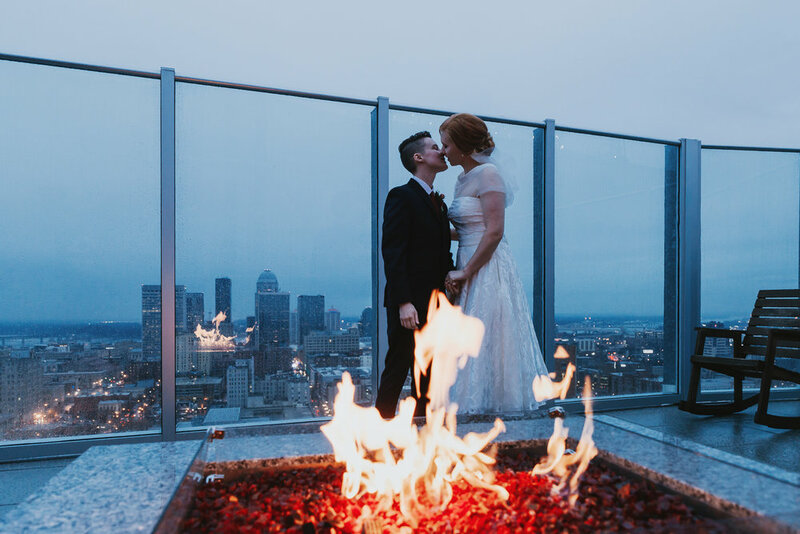 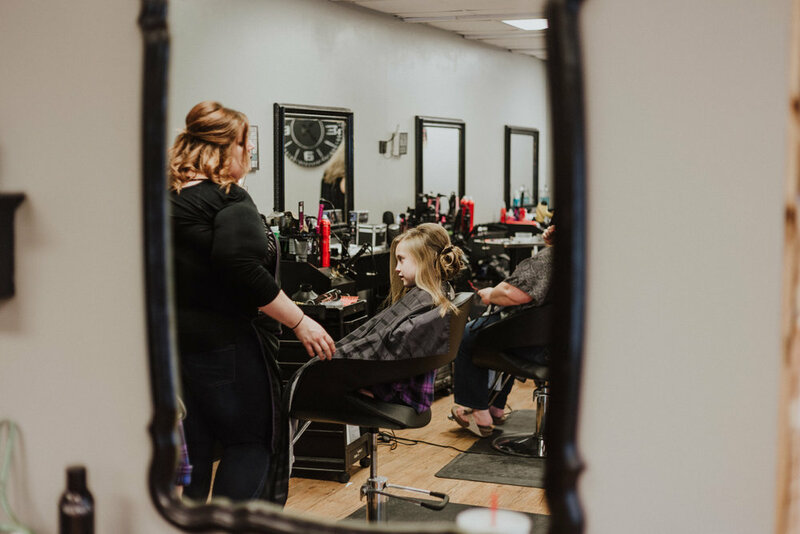 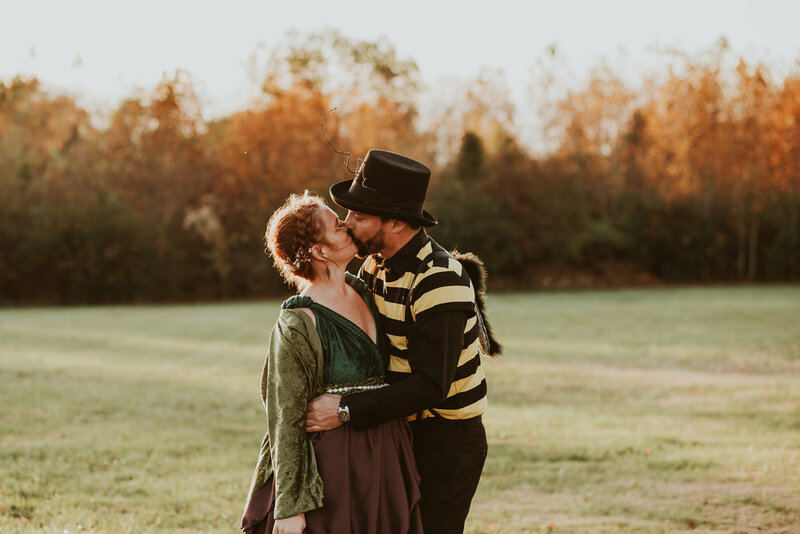 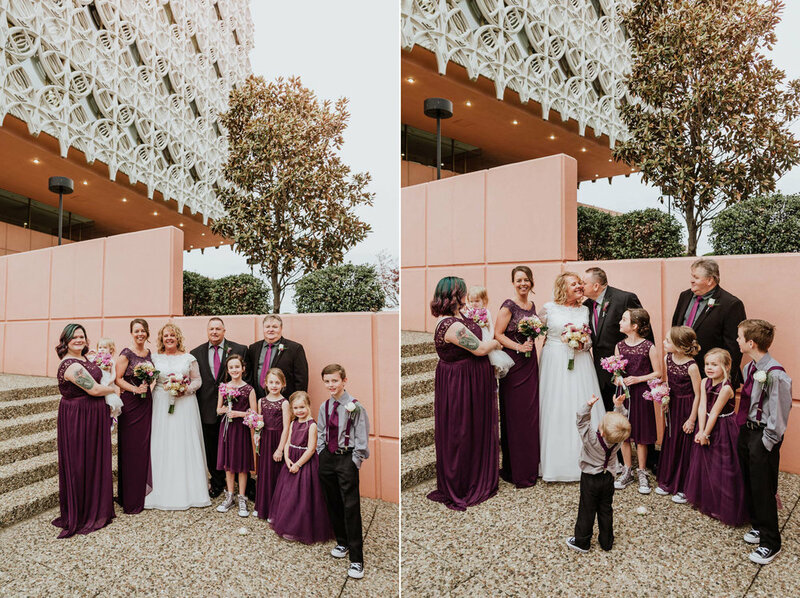 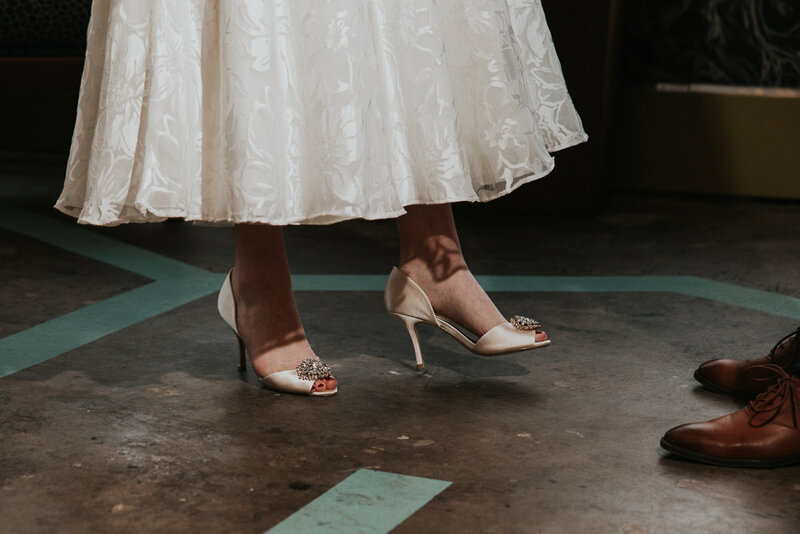 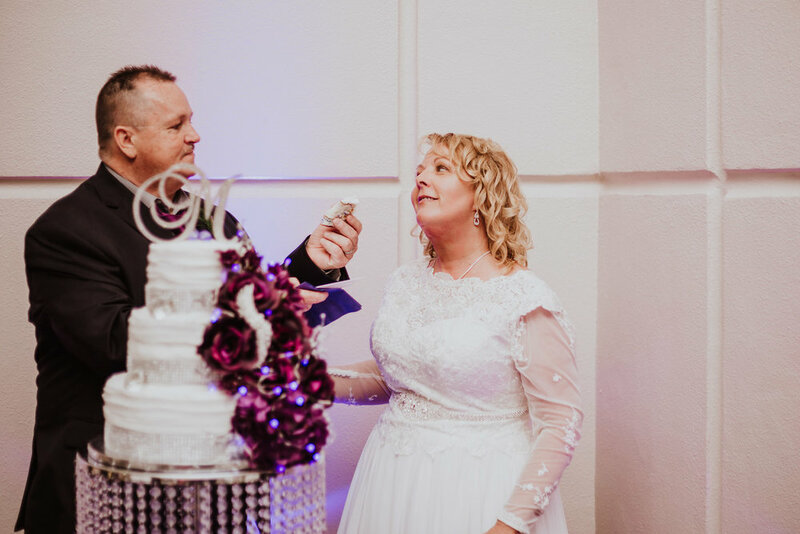 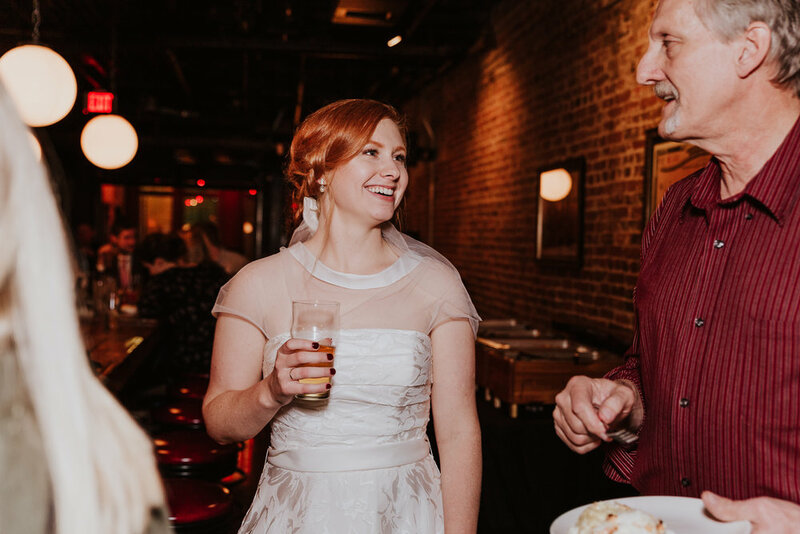 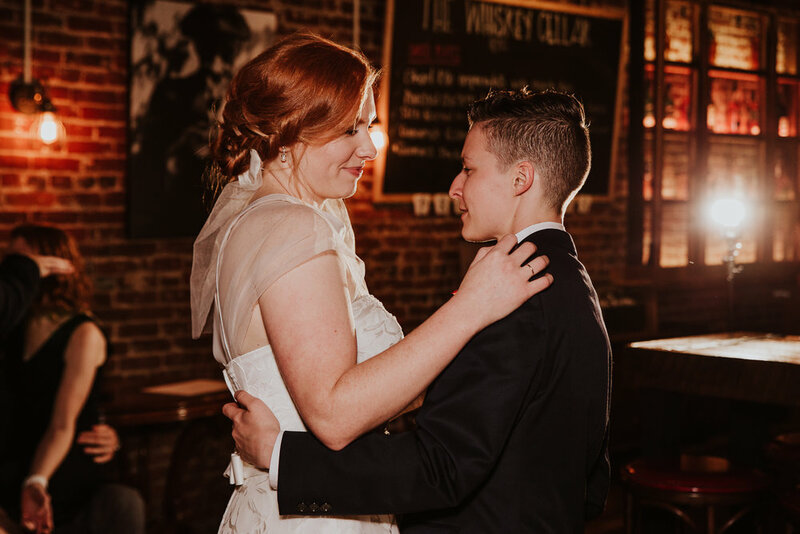 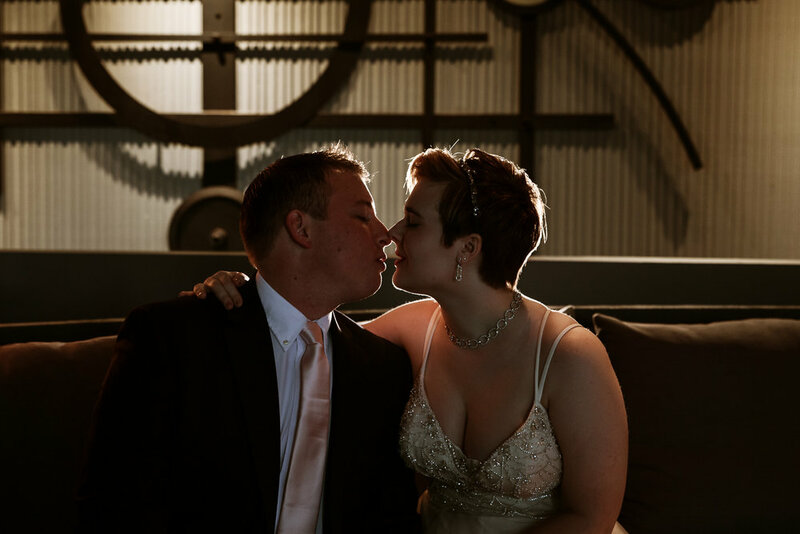 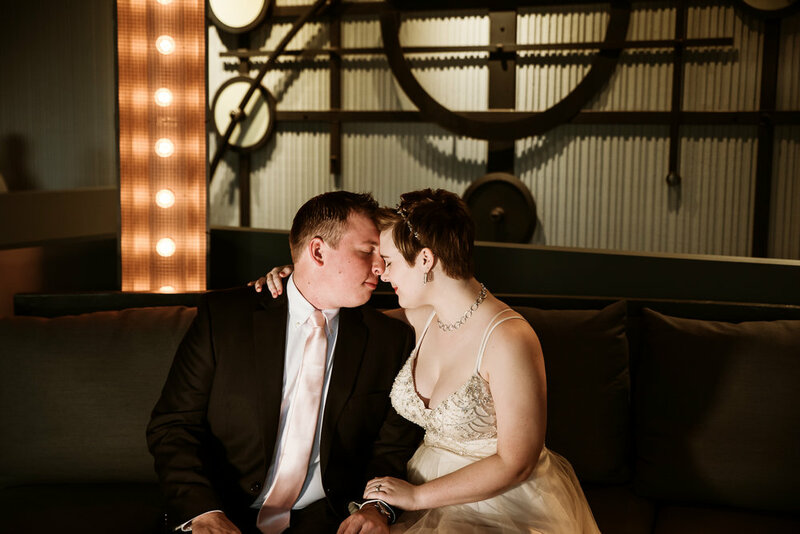 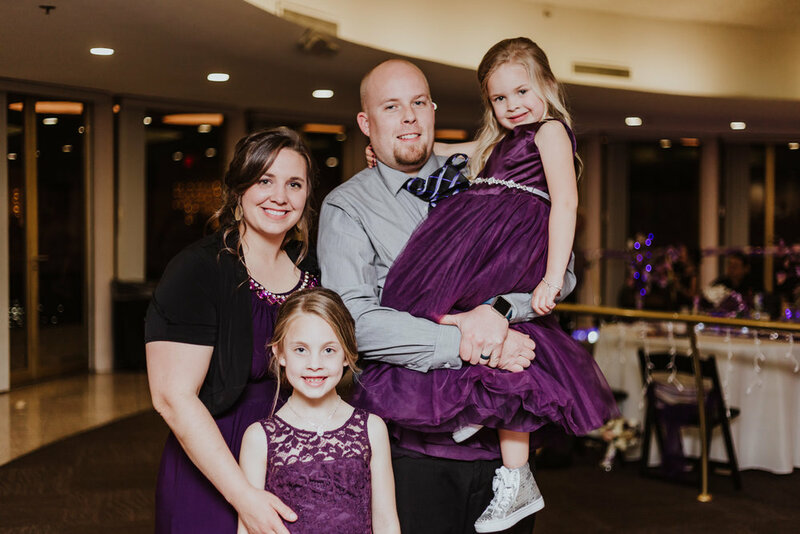 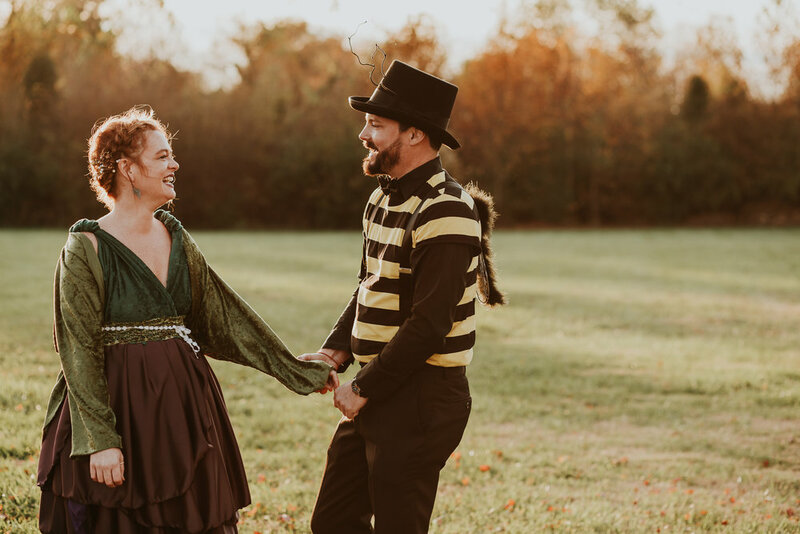 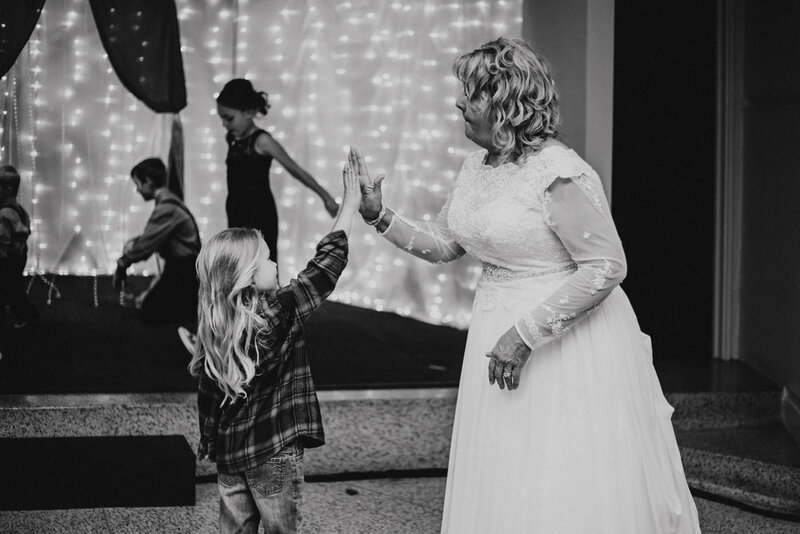 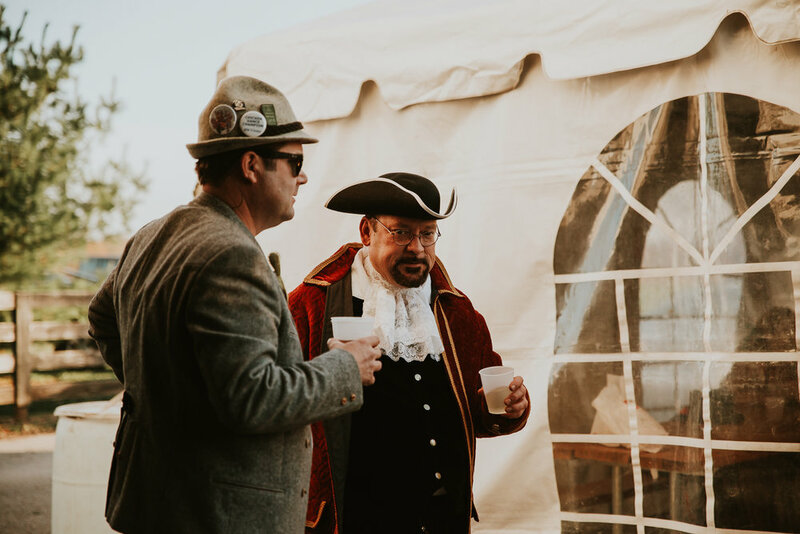 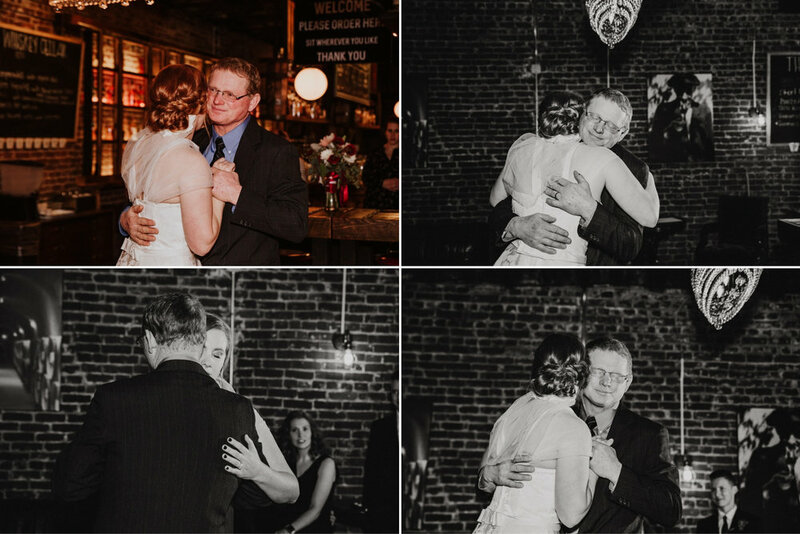 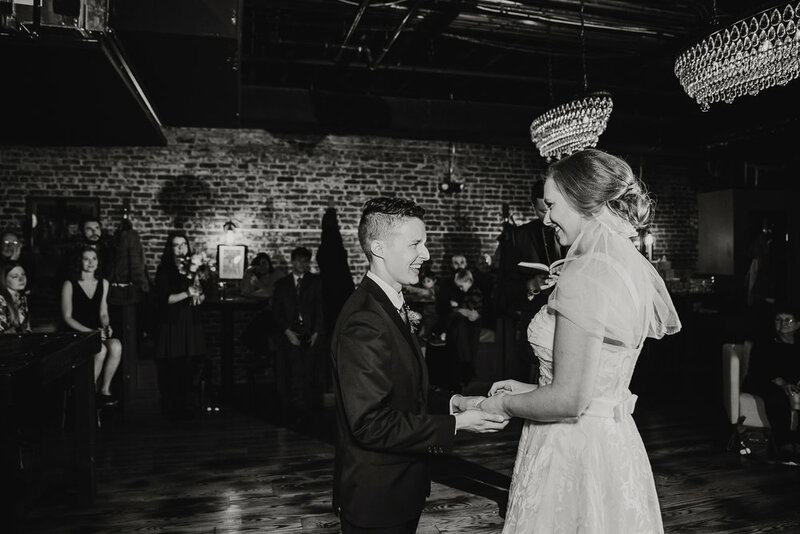 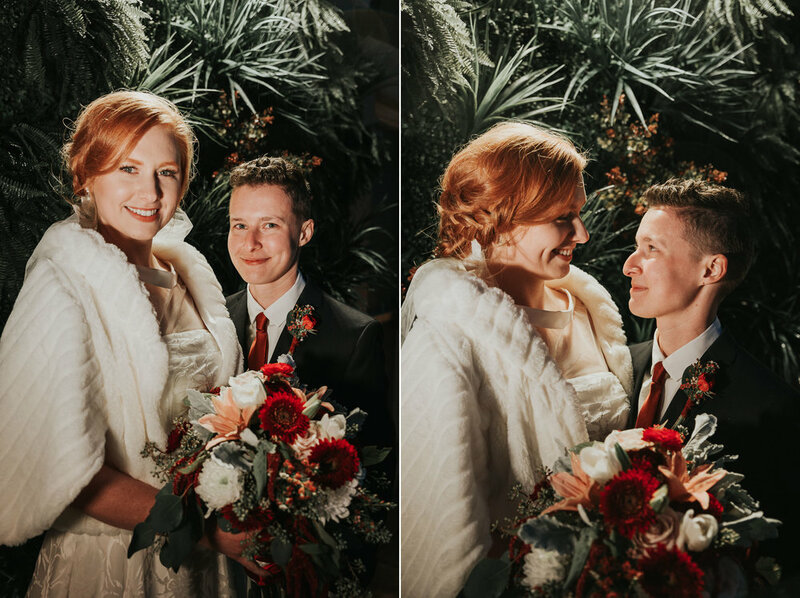 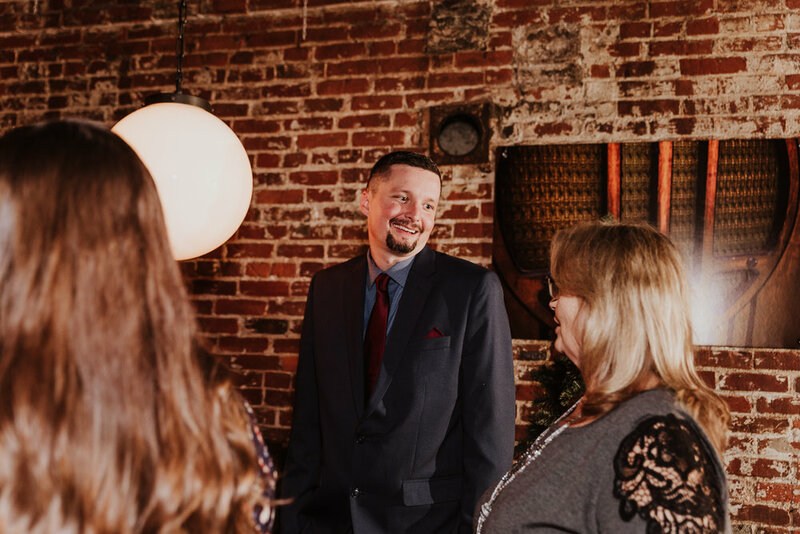 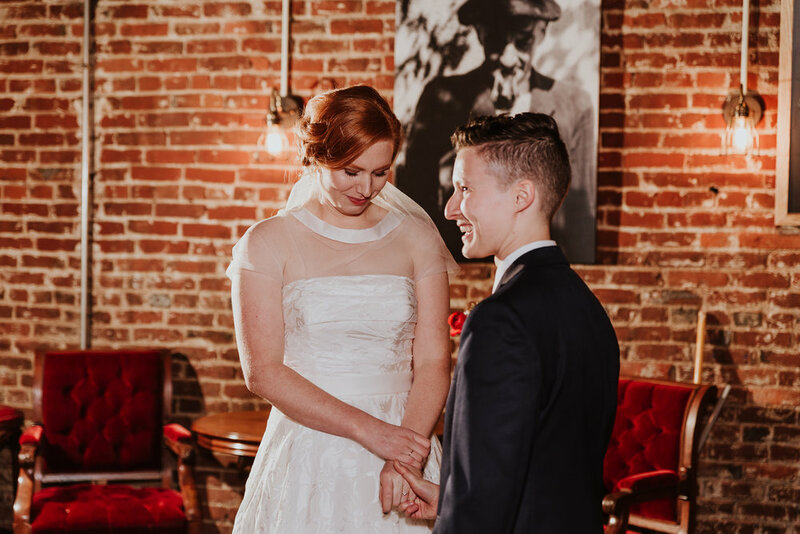 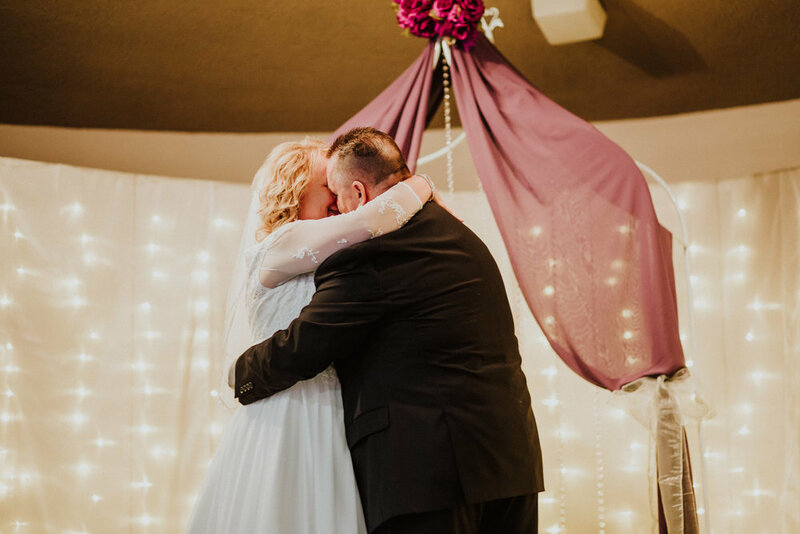 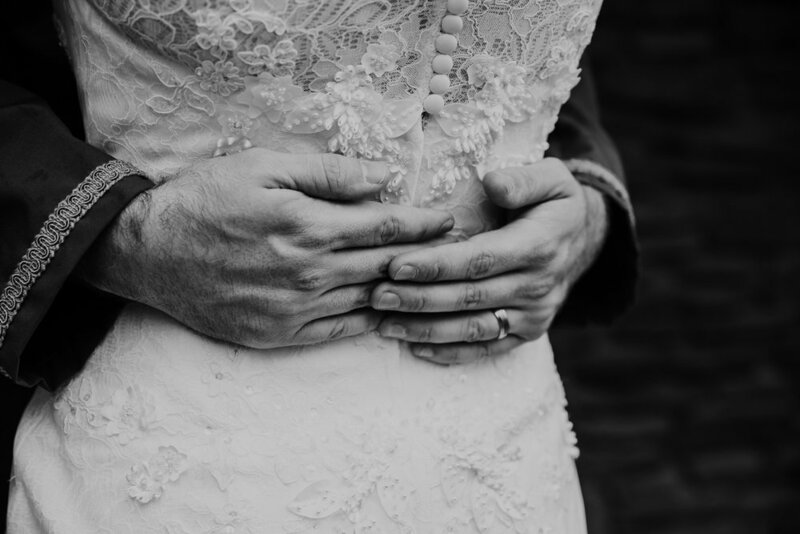 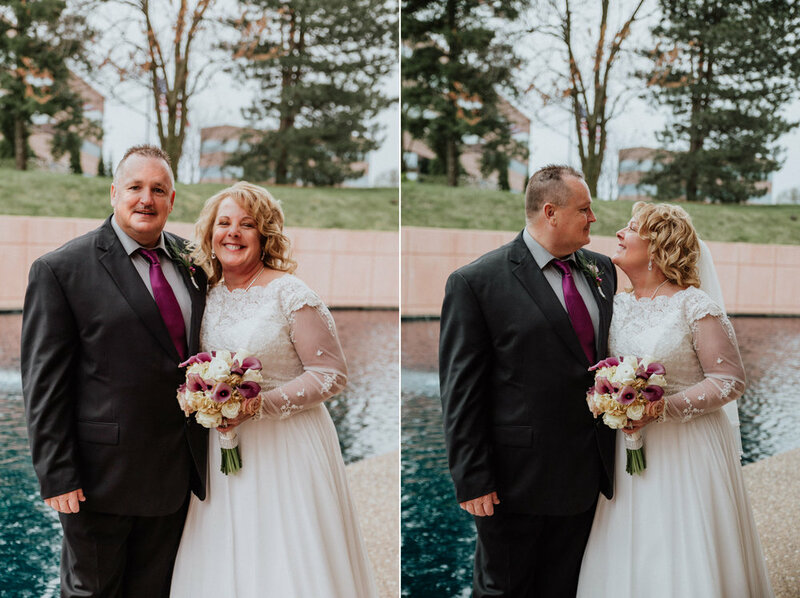 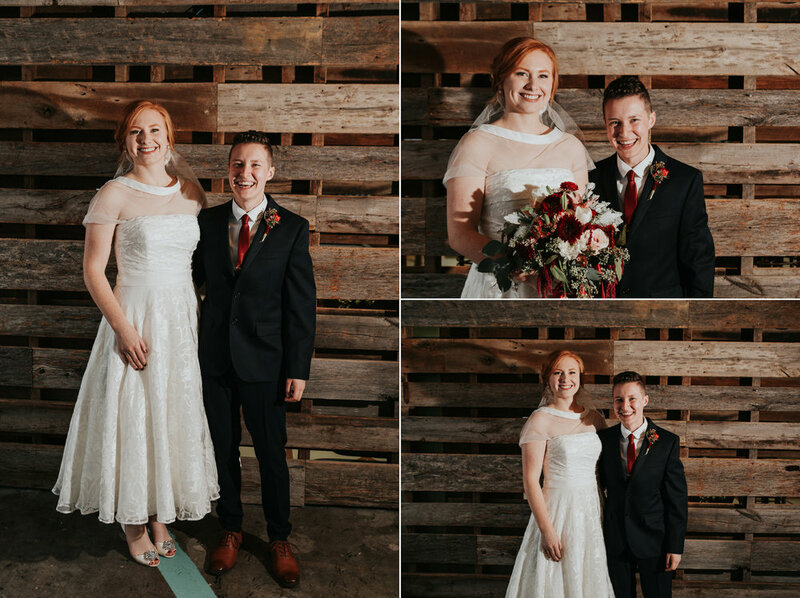 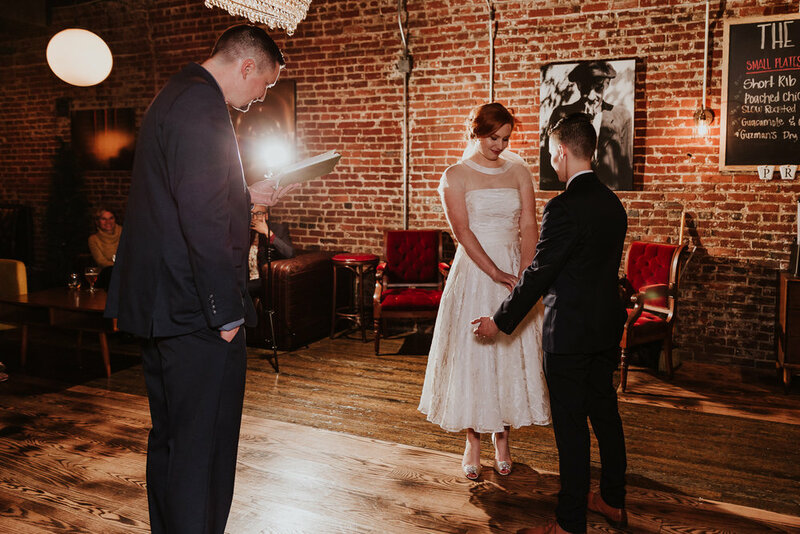 That love was returned to her and Duane ("Fireball") on the day of their wedding at Kaden Tower Civic Center, where they married this April with their close friends and beautiful family in attendance. 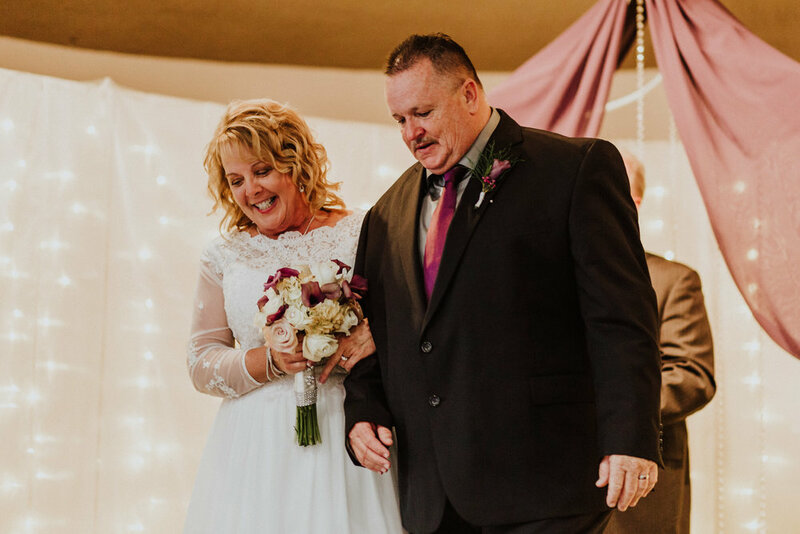 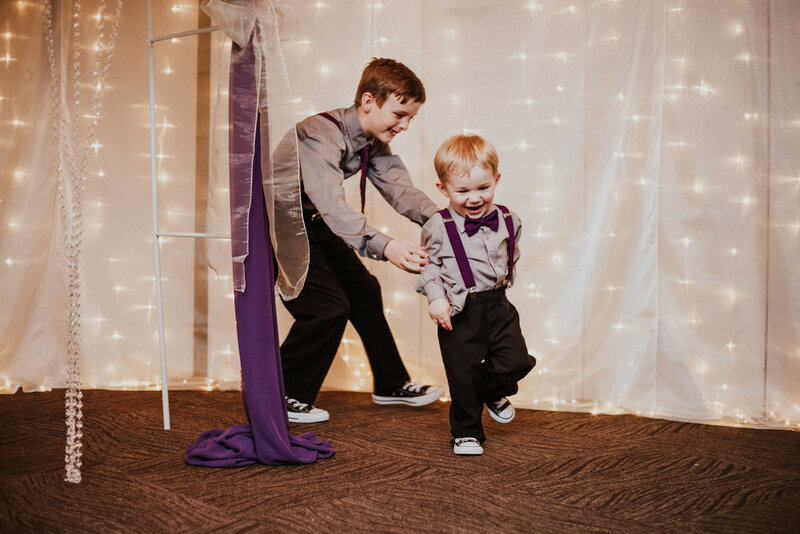 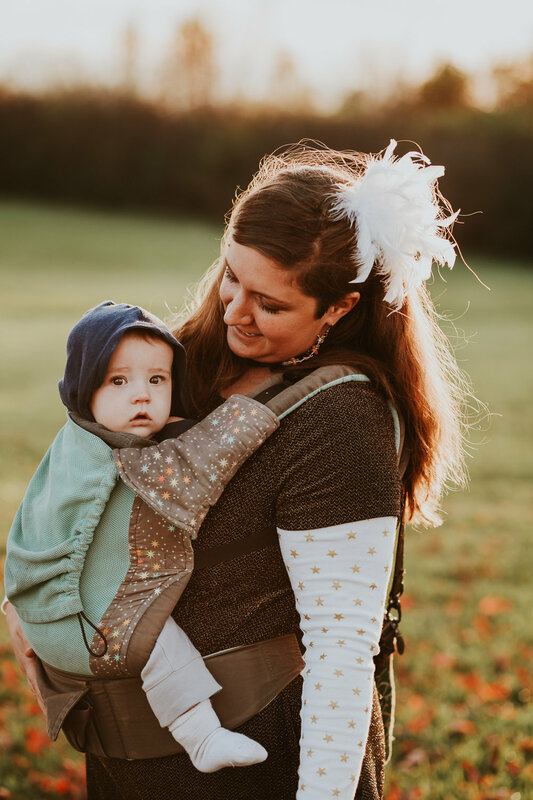 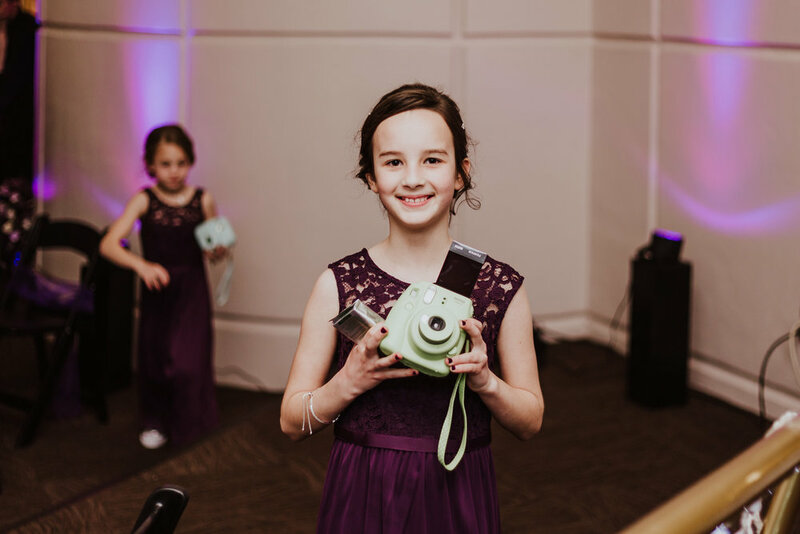 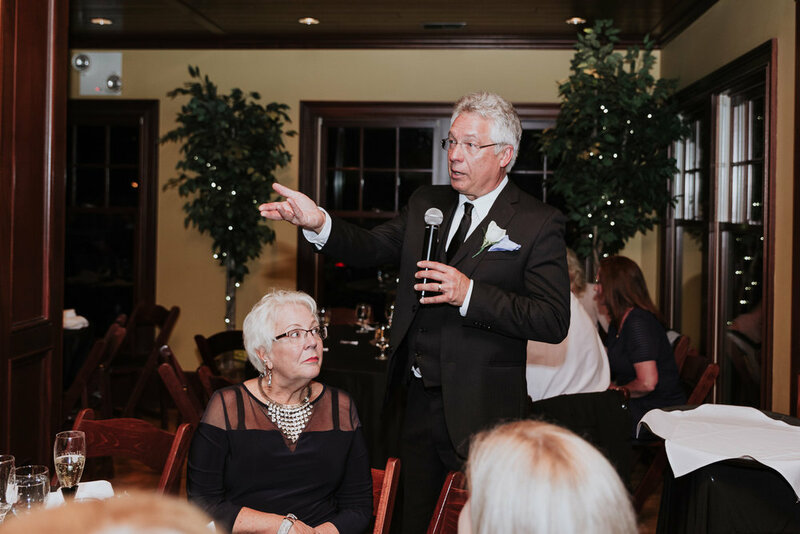 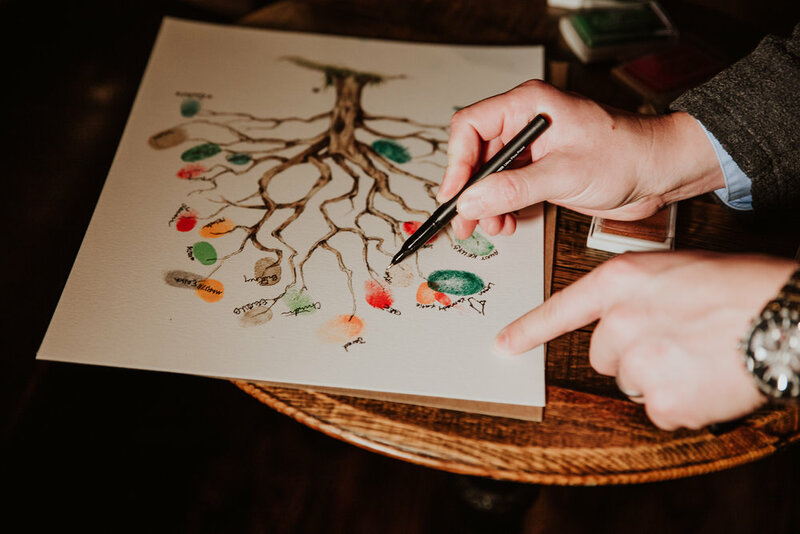 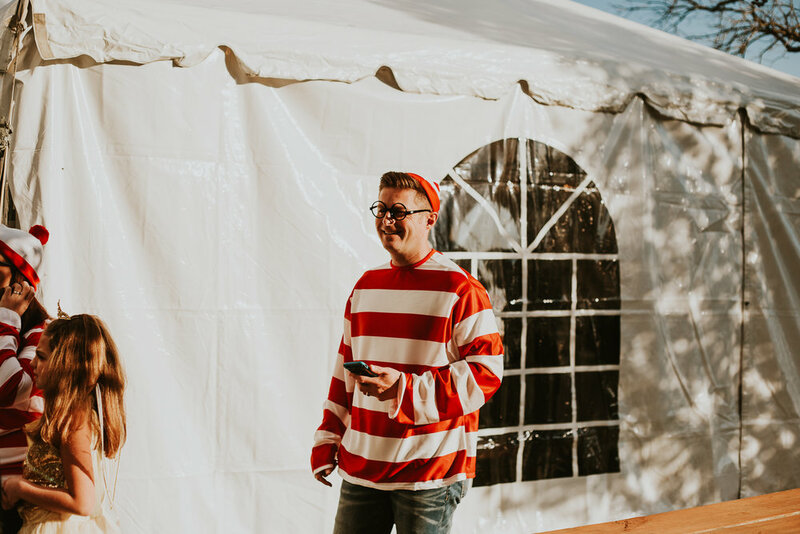 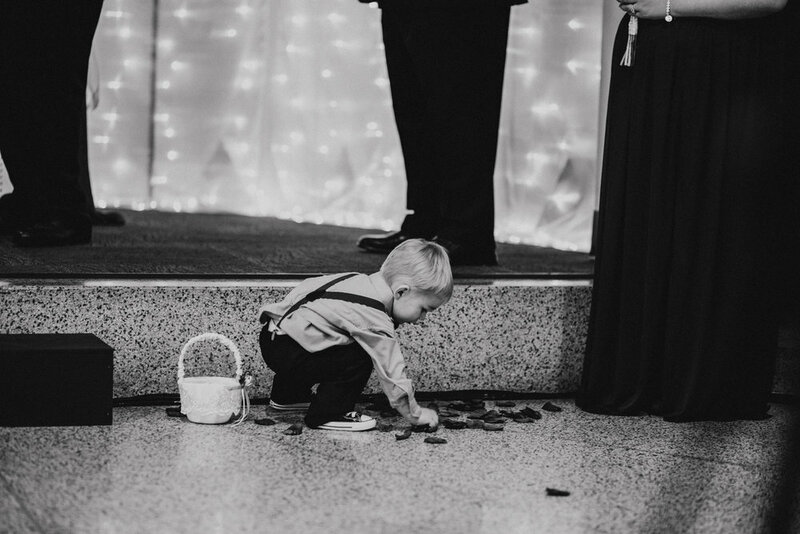 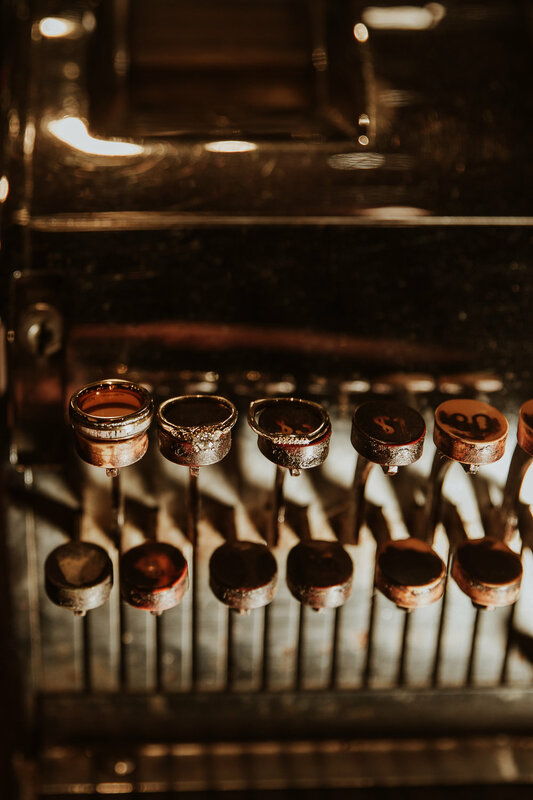 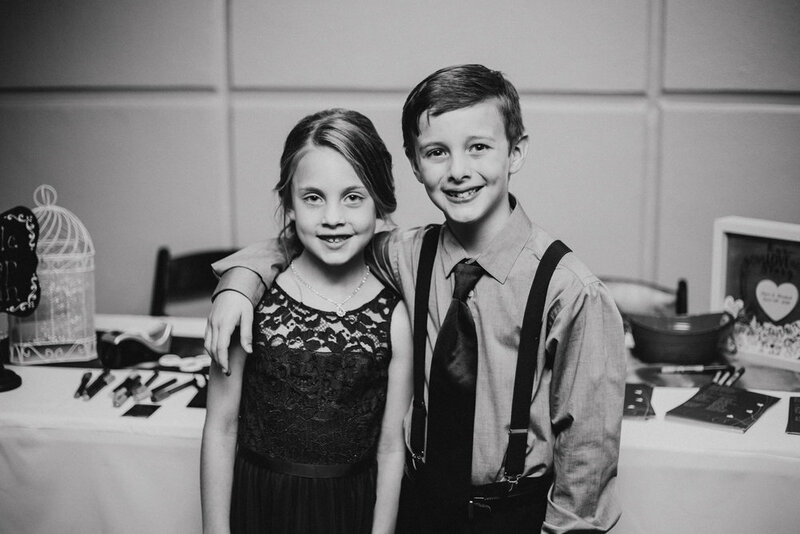 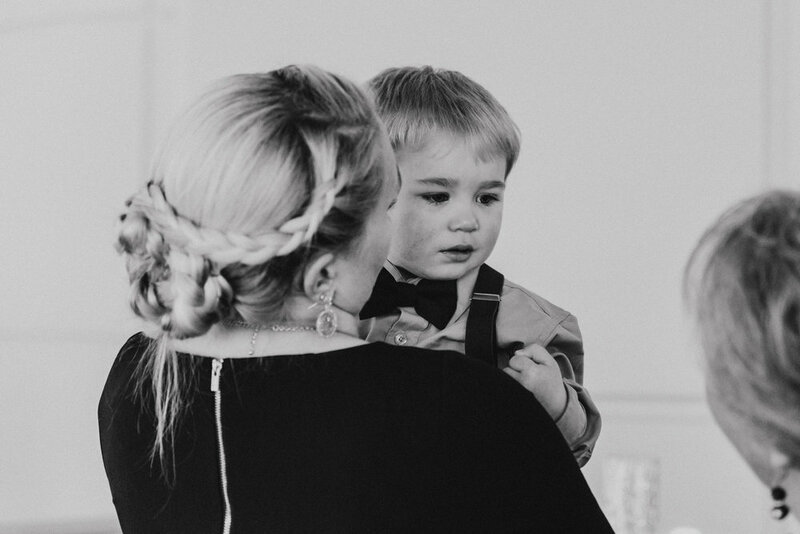 Sheri's brother officiated the ceremony, the grandchildren provided ample entertainment, and each of their children glowed with love for them in their happiness. 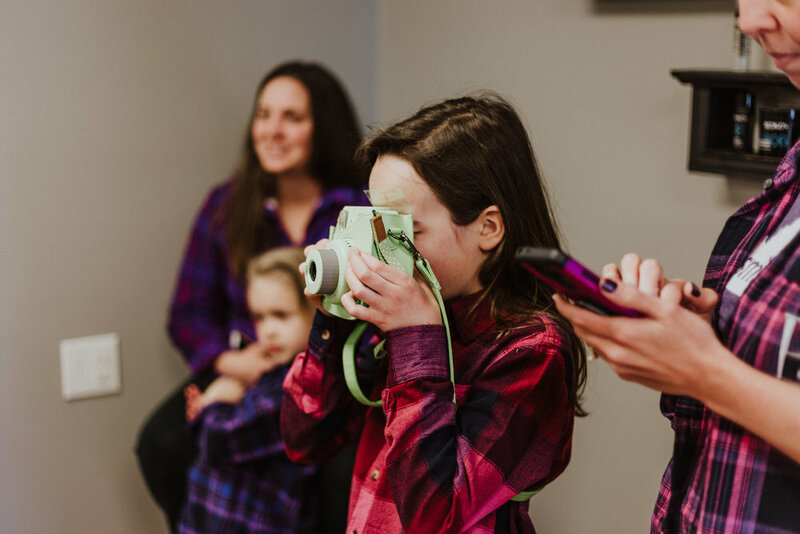 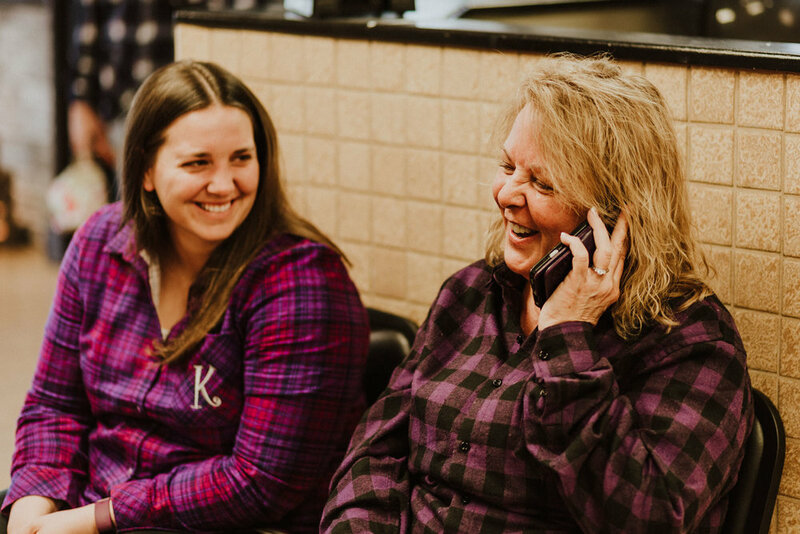 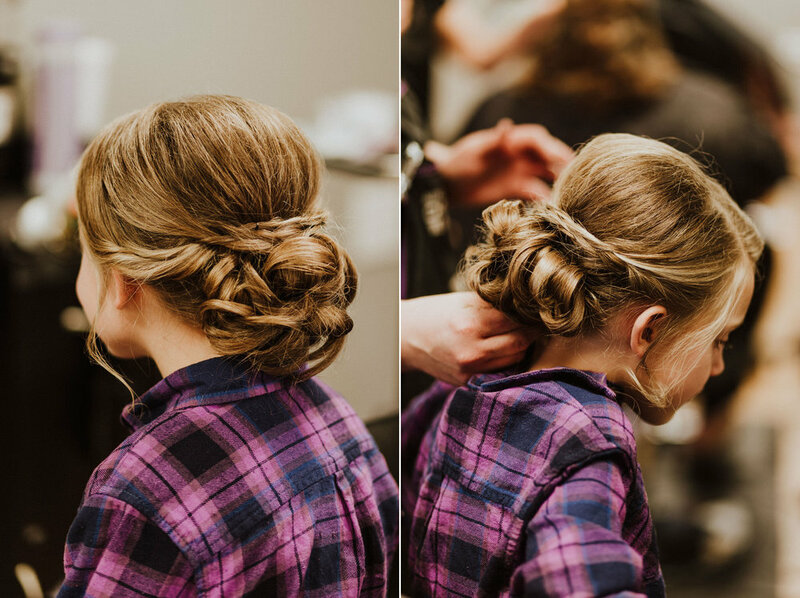 Clad in monogrammed purple flannel shirts, Sheri and the girls got ready at Salon Four Eighty in Shepherdsville-- updos and curls with bits of bling here and there (the wedding's theme was "purple and bling")-- and there were mini-photographers (grandkids) darting about taking Polaroids (I was kind of jealous of their cute, colorful cameras!). 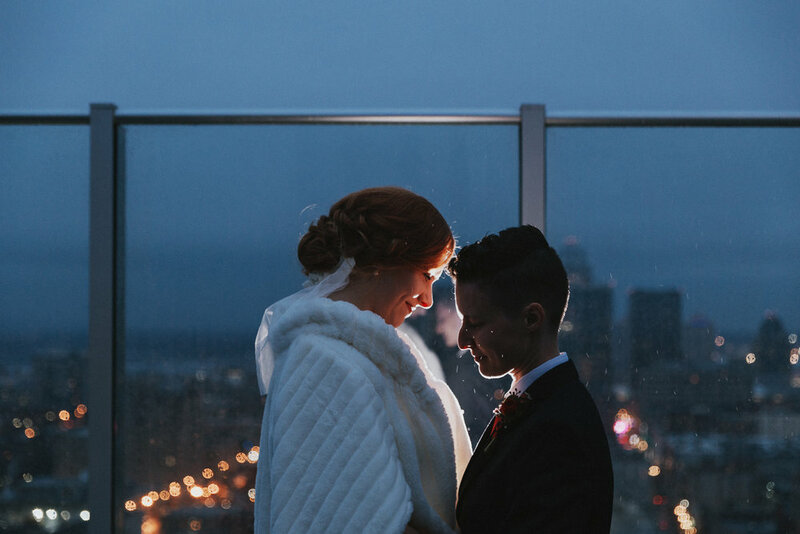 We were lucky with mild weather, as the forecast for the day had suggested thunderstorms! 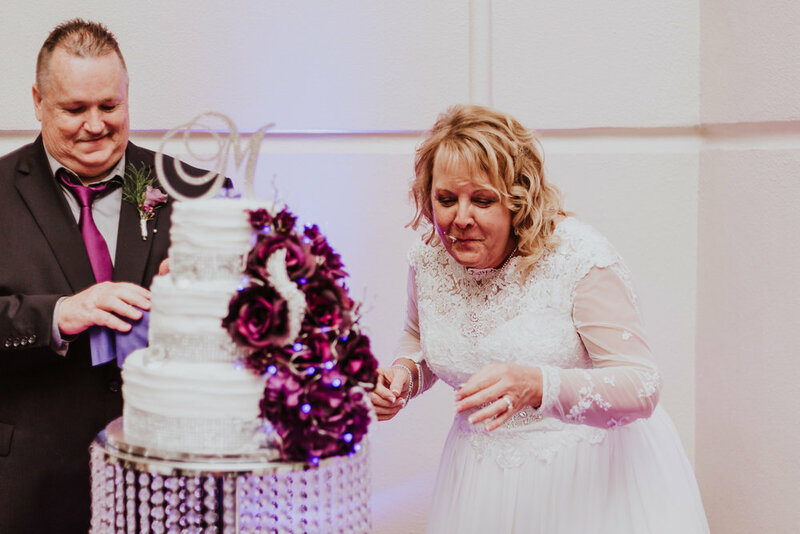 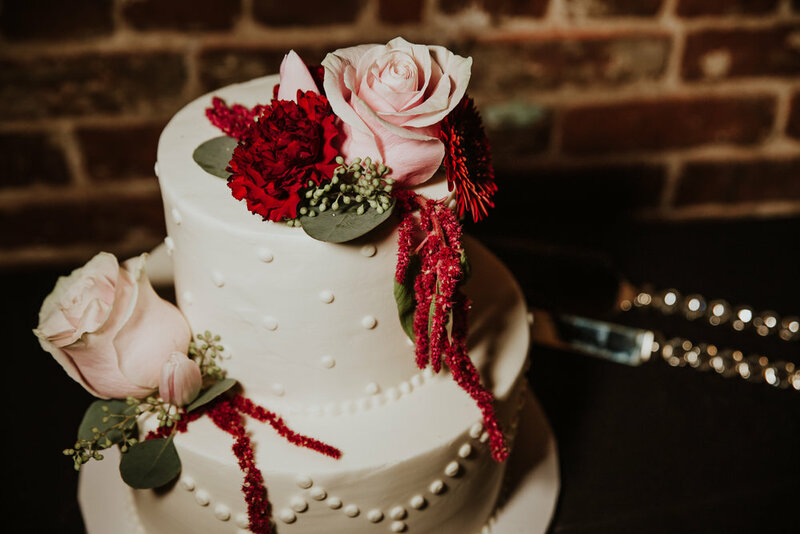 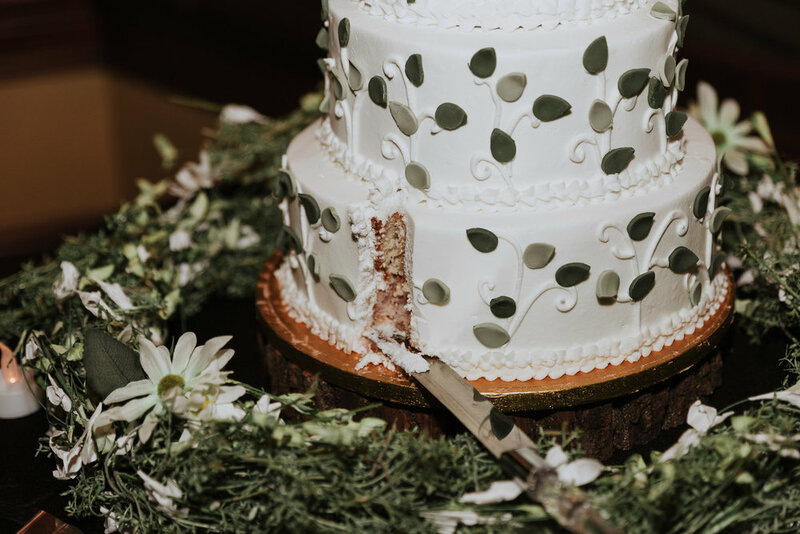 The detail and thought they put into their decorations at Kaden Tower was notable-- Sheri even decorated her wedding cake herself so that it had bling befitting the theme. 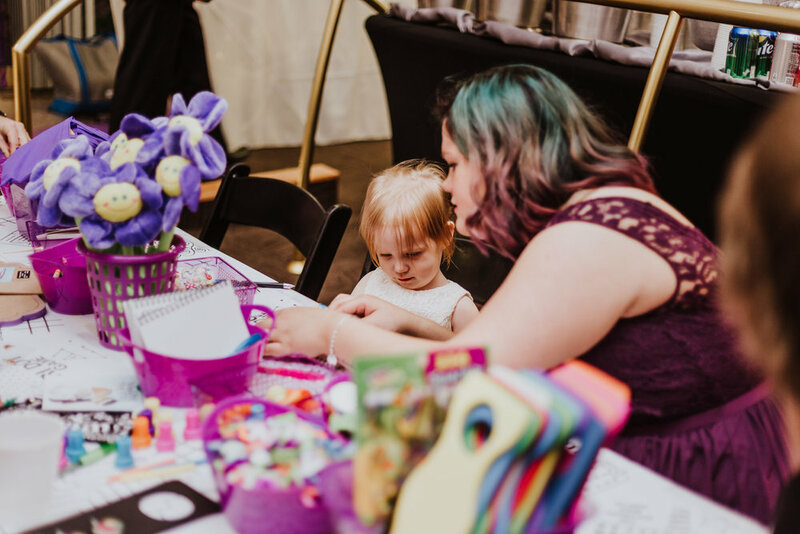 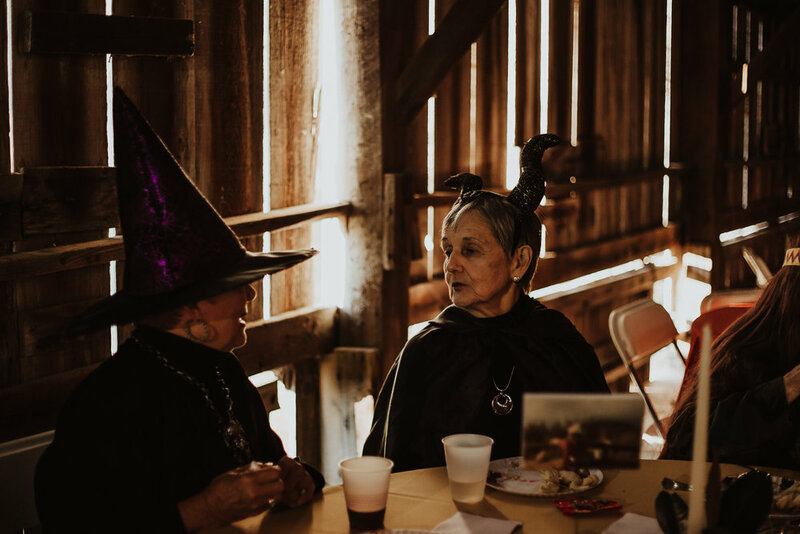 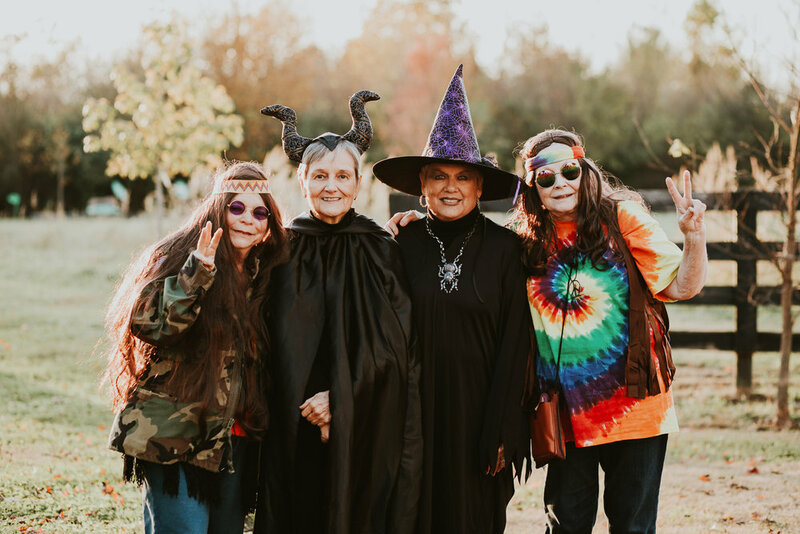 It was clear they had planned carefully to entertain the grandkids, with a table of kids activities, and dinner included a chocolate fountain and waffle bar. 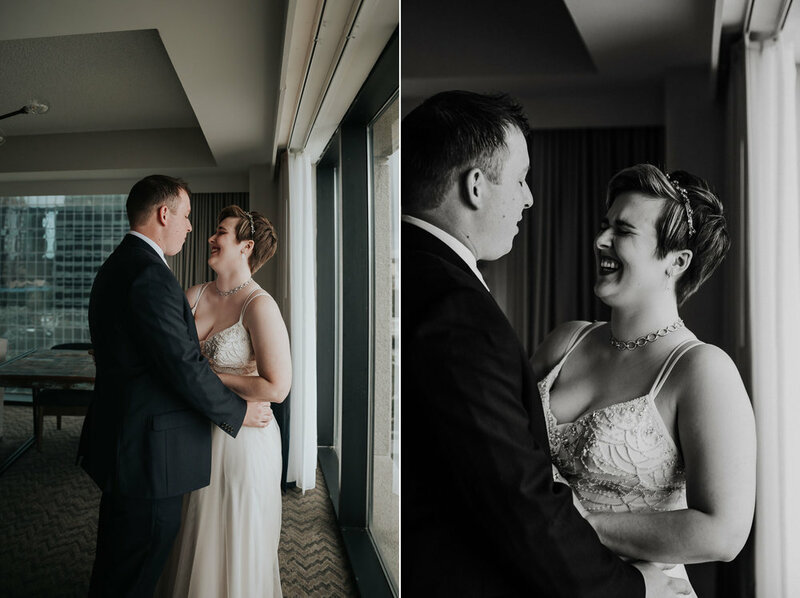 Everyone was all smiles and laughter was abundant on this wedding day!